Three days on the road since leaving Yellowstone, losing my driver’s licence, reentering the park and driving in the darkness through the Grand Tetons and treacherous roads in southern Wyoming. Admittedly, a lot went wrong in this portion of the trip! First, following an old friend’s advise to visit Cody, which according to him was the most western city where cowboys strolled down the streets as in a Hollywood Wild West movie, brought me a couple of unexpected events. First, a good one! Having left Yellowstone on a cold, snowy day, I ended up camping at the Buffalo Bill State Park. This is a site that jumped on me, as I had not known about it. The eastern side of Yellowstone was covered in snow and ice with a mix of rain and sleet; the Buffalo Bill park was the first place that seemed dry enough to set up camp. After setting up camp right before sundown on the shores of the lake, I headed into town to purchase food and firewood. I did not notice any of romanticized side of Cody that he had described to me while insisting that I could not pass the opportunity to visit the town. My initial thought was that I was in a newer part of town and later I would find the picturesque, quintessential Cody! Heading back to the park, I was sent to a dead-end road in the dark. The GPS sent me to what I assumed was a back road to the park, bringing me to a padlocked rusty gate. After turning around heading back toward downtown Cody, I tried to reset the GPS a few times. For some reason it kept trying to send me to the same dead-end road. I then set it to take me to Yellowstone, as I knew that the Buffalo Bill State Park would be on my left. It was a dark night! I finally made back to my camping site and as I was lighting the fire, a car pulled up. The park was practically deserted. In the section for tents I did not see anyone else camping that night. Closer to the entrance of the park in the RV section there were only a couple of campers. When I arrived at the park earlier the booth at the entrance was not staffed. I filled out the self-registration form, included the payment, and deposited the envelope at the drop box. As the driver came out of the car and walked toward me, I thought that he was one of the park employees who may randomly stop by and check to see if fees have been paid. It turned out that he wanted to know if he could camp for the night at the park as he had not found anyone at the gate. I explained to him how the self-registration worked, but he said that he was a traveler from overseas and had no checking account to write a check or cash in the exact change. Credit card would not work! My advise was go ahead and camp! If someone shows up or if someone is at the booth when he left in the morning, explain the circumstances of his arrival and offer to pay the fees. I also told him to go ahead and set up his tent quickly before it got dark. As he walked away he asked me if I would mind if he came back to share the fire. The lake and the surrounding area at the Buffalo Bill State Park is beautiful. However, it can get mighty cold! 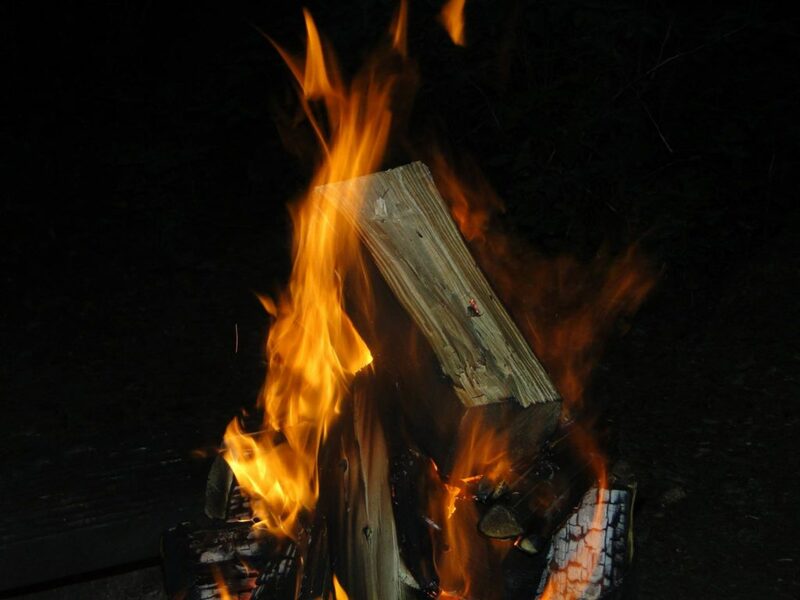 As my campsite neighbor came by and sat by the fire with me, the temperature continued to fall down to the mid twenties. It had been a while since I had enjoyed the company and conversation with someone culturally stimulating. It turned out that he had been in the United States for a couple of months as part of his studies in biochemistry as a PhD student from Eastern Europe. We talked well into the night and when I woke up the next morning he had already taken off. Buffalo Bill Dam is a concrete arch-gravity dam on the Shoshone River in the U.S., named after the famous wild west figure William “Buffalo Bill” Cody, who founded the town of Cody. Most of the land now covered by the reservoir was owned by Buffalo Bill, as the land in the town of Cody and surroundings. 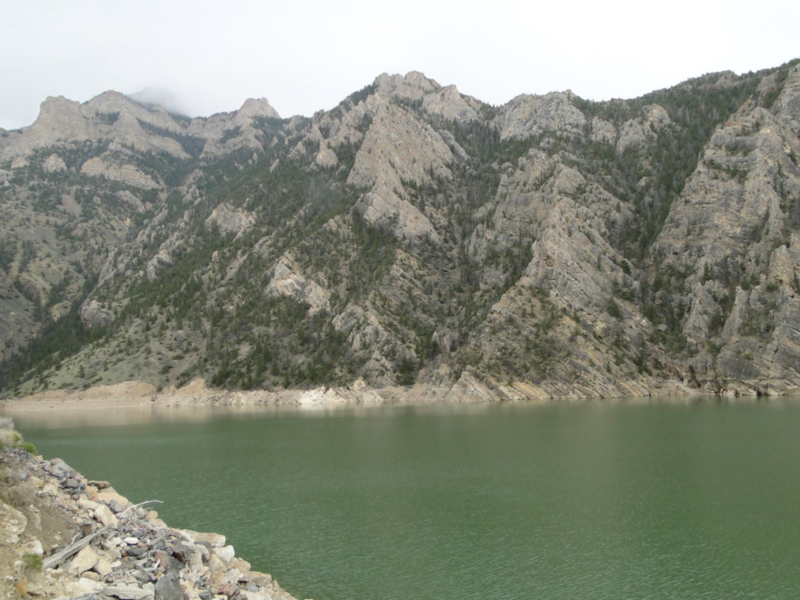 The dam is part of the Shoshone Project, successor to several visionary schemes promoted by Cody to irrigate the Bighorn Basin and turn it from a semi-arid sagebrush-covered plain to productive agricultural land. 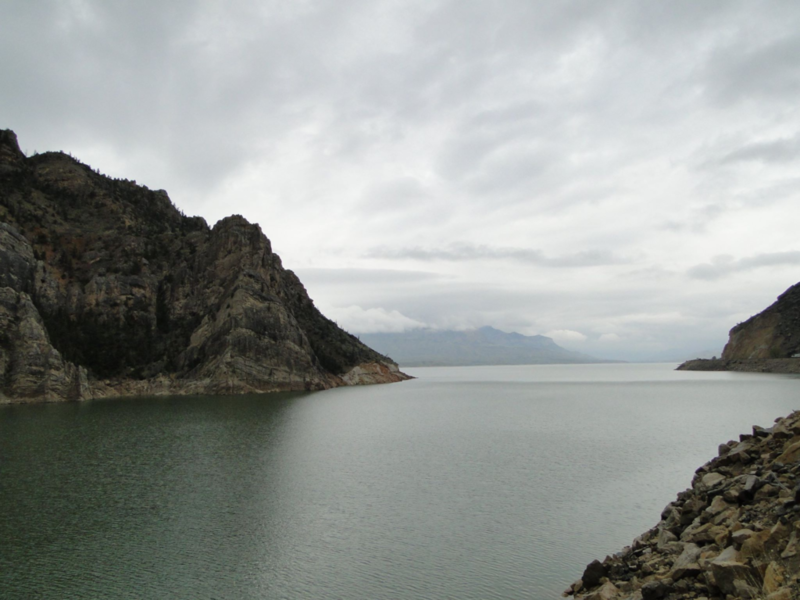 Known at the time of its construction as Shoshone Dam, it was renamed in 1946 to honor Cody. After visiting the dam and learning about its history, it was raining heavily and I was ready to leave the area. There was no point in staying any longer. The bad news! I was feeling good until I came to the east gate of Yellowstone. As I tried to produce my driver’s license to re-enter the park, I realized I had lost it. It was nowhere to be found. After searching the car, I returned to the camping site that I had just left and I could not find it. At that point I had no other choice but return to Cody and retrace all the places I had visited before going to the Cody Police to report that I had lost my driver’s license. Here it is where it gets a bit funny! It was a bit difficult to convince the police that I needed some sort of document proving that I had lost my driver’s license, so I could continue on with my road trip. After all, I was still about two weeks from getting back home. In the meantime, I was able to get a copy of my lost document through the online services offered by the New York State’s Department of Motor Vehicle. Even the police officer who was assisting me was quite impressed about how quickly my husband was able to get me a copy of my driver’s license faxed to me in Wyoming. Nonetheless, I had lost too much time and I still had to return to Yellowstone and head south toward Utah. 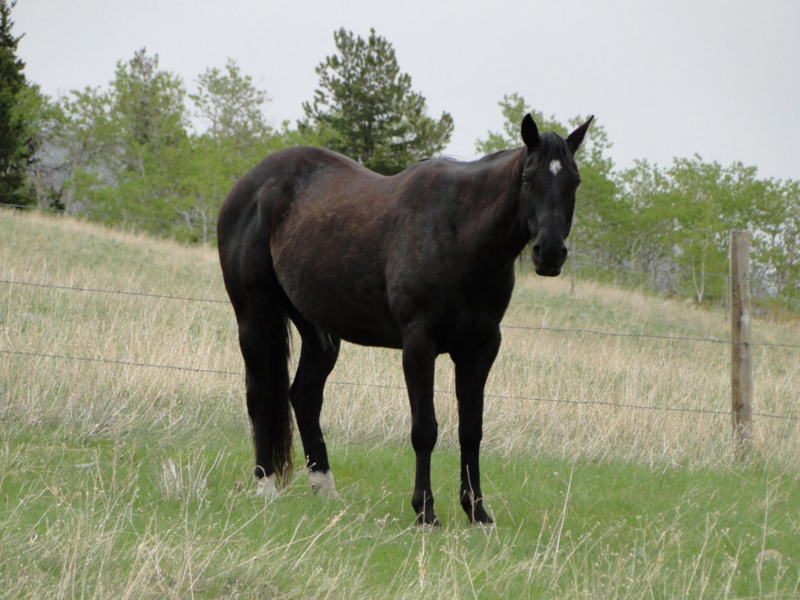 The weather forecast for western Wyoming was for rain for the remainder of the week and beyond. Naturally, everyone kept telling me how unusual the weather had been. My decision was to head south and try and scape the rain and snow that was in the forecast. Destination!? Zion National Park in Utah. After all, it appeared that even the cowboys had left Cody! A word of advise to anyone traveling in this part of the country! From Cody, re-entering and crossing Yellowstone and through the Grend Teton National Park, there is no lodging that is easily found until getting to Jackson, which is the town that sits in the area known as Jackson Hole. Jackson is, however, the ‘cowboy’ town of the West. It is a tourist destination and hotel prices in the area are quite high. Camping in the winter and rainy season can be difficult, as I found out first hand. After spending too much time driving behind herds of buffalos, it was pitch black dark as I crossed the Grand Tetons. I was exhausted and it was very late when I finally arrived in Jackson, but it was comforting to finally see some cowboys enjoying whiskey at the bar and hearing the cracking of the wood in the fireplace. Yellowstone National Park: How to Plan a Visit? Often I am asked which one is my favorite national park? Yellowstone? Yosemite? The Grand Canyon? It is hard to tell! It is almost like asking a parent to pick a favorite child. My response is that they differ from each other and they are great on their own merits for different reasons. For hiking I prefer the Grand Canyon because both the Bright Angel Trail and the South Kaibab Trail rank highly on my top five favorite hiking trails. And what can I add to Yosemite? It is referred to as the mother of all parks and I am not going to dispute that. 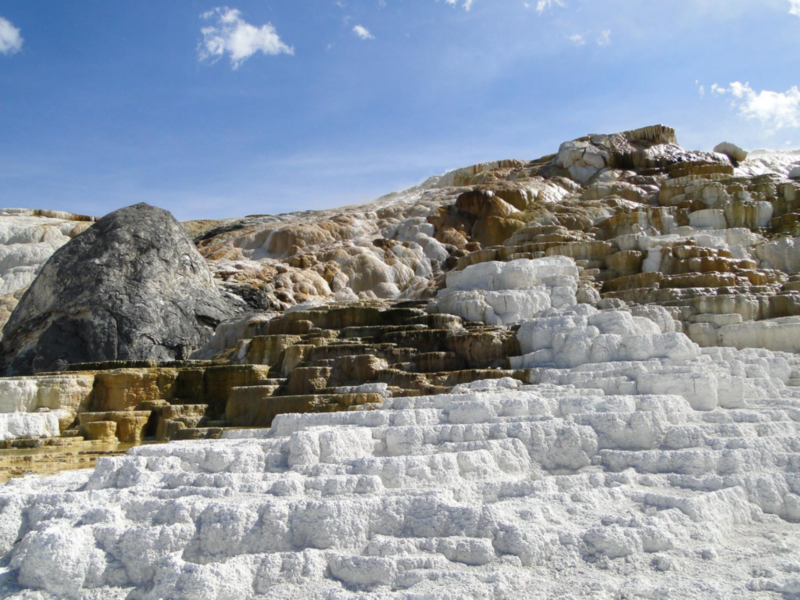 However, it is one of the busiest national parks along with Yellowstone. Not only the iconic Old Faithful, but the majority of the world’s geysers and hot springs which are preserved in the vastness of the Yellowstone National Park. How to plan a visit to Yellowstone? 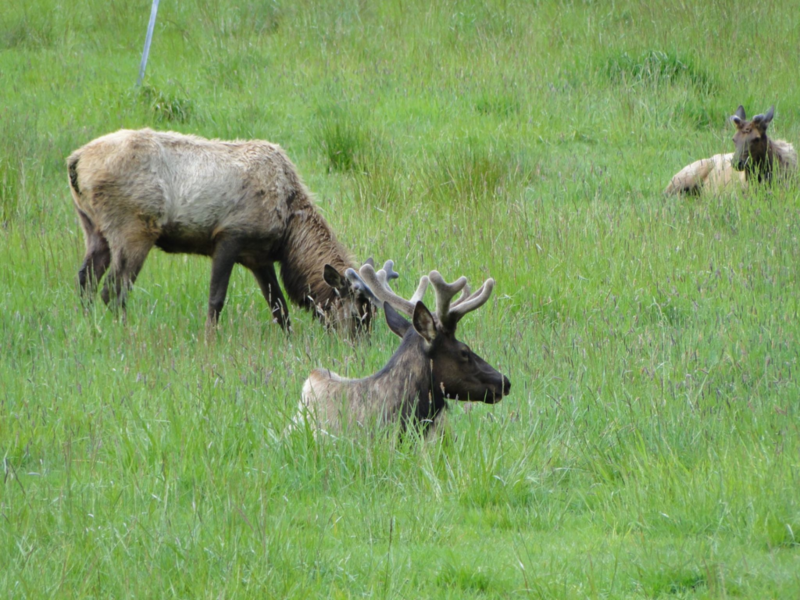 What to see and do depends on how many days one plans to spend in the park. The options abound and it is hard to choose which attractions to explore. On a morning in the Spring of 2016, I was headed to Yellowstone not knowing if I would stay one, two, or three days. It all depended if I would be able to get one of the first-come, first-serve basis campsites and how many days would I be able to get.True to what I have written before, one of the joys of a road trip lies on the fact that it is not only about the destination; it is also about what we see on the road. 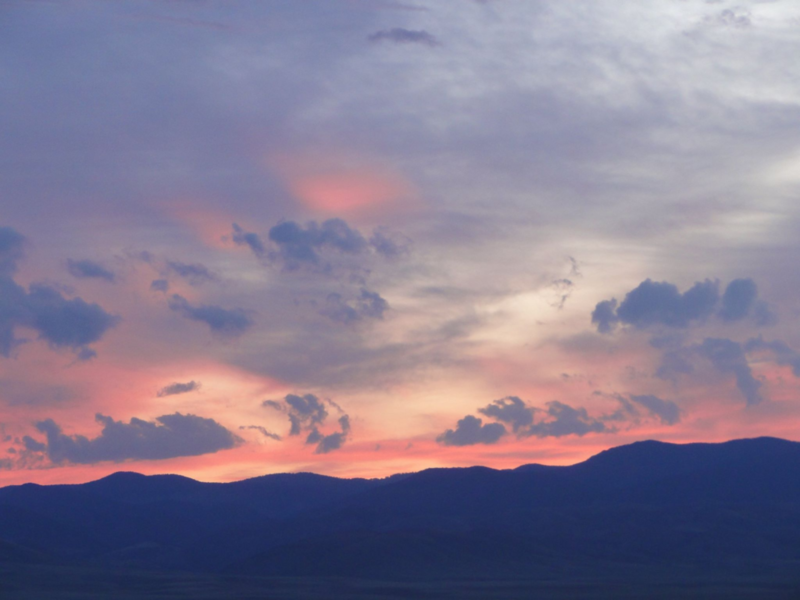 Having driven from Glacier National Park in northern Montana, on my way to Yellowstone I spent the night in Bozeman. After a couple of days of rain and snow, I woke up to a beautiful, sunny morning. The skies were bright blue and the views were simply amazing. Driving in scenic Yellowstone country is one of a kind drive! Since one of the campgrounds open in early Spring is Madison, I had to use the west entrance to get in the park. I drove south on US-191 passing by Big Sky and driving along the west edge of Yellowstone. Passing through Arizona, Utah, Wyoming, and Montana, this highway not only cuts through Yellowstone and Grand Teton National Park, but it is perhaps the most scenic highway in the United States. A road trip along this highway is memorable, regardless of the time of the year. It was my lucky day! I arrived at the Madison campground just in time to get one of the last campsites still available. The campsite itself was good and well located. However, it is a rather ‘busy’ campground. With a lot of RVs and trailers, it has a lot of traffic. Moreover, for the lack of shrubs or trees, there is no privacy or protection from the wind and the dust the comes with it; something that could not go unnoticed because it was a particularly windy day. In fact, the wind was so strong that a couple of tents in a site nearby had been blown away. Setting up the tent under strong gusty winds was a bit tricky, but I secured it with extra pegs. Yet, as I drove to Big Sky to meet a friend for lunch at the Lone Peak Brewery, all I had in my mind was whether or not the tent would be still there when I came back later. My planned three days stay at Yellowstone did not include plans to hike because of the minimum three people for hiking. I would spend three days of sightseeing; and there is plenty to see in Yellowstone for days! Just driving through the many roads that crisscross the park offers the most spectacular views. Nonetheless, as the National Park Service publication warns, travel hazards and delays are to be expected. Driving cautiously and defensively is a must! Road congestion are not only caused by the number of vehicles but by the wild life in the park that has the right of the way. In the early hours of the day and before sunset, herds of bisons can take the entire road bringing traffic to a halt. In a 2.2 million acres park with so many attractions, planning what to see based on how long one is visiting Yellowstone is essential. It is tempting to try and cover as much as possible. However, I would not recommend overstretching the list of things to do and attractions to see if time is limited. 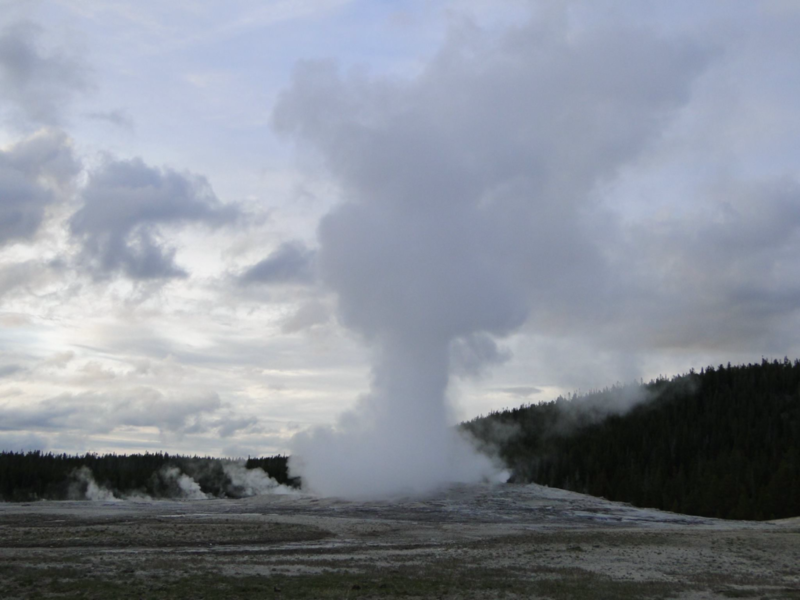 For a one day only visit, I think that it is intuitive to visit the Old Faithful area and walk around the geyser basin. The Old Faithful is undeniably the poster boy for Yellowstone. 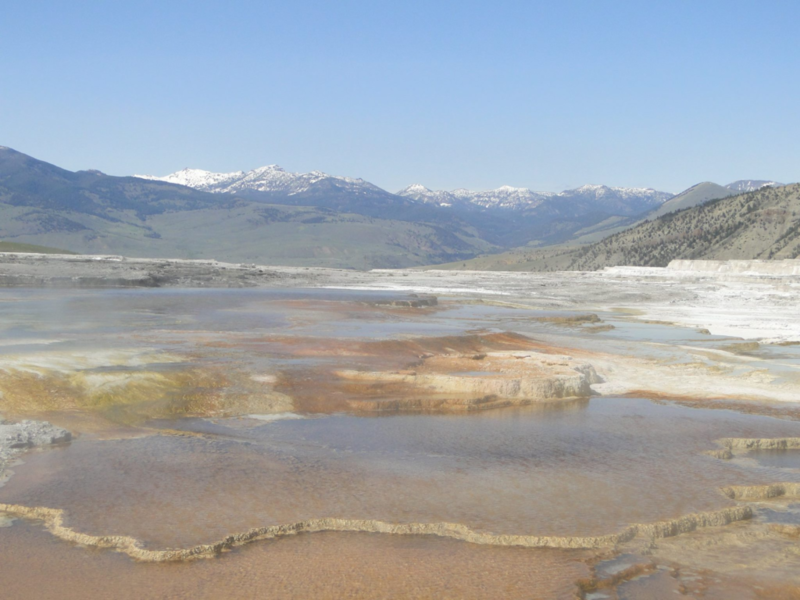 For a one day visit, one can add one of the other hydrothermal areas, such as Norris, West Thumb, or Mammoth. Quite frankly, they are my favorite features. 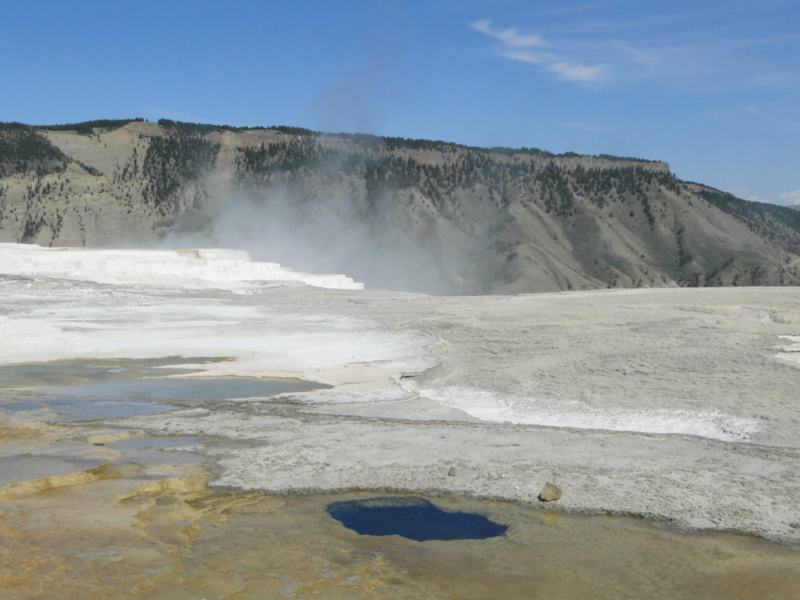 With two or more days to spend at Yellowstone, one can explore one area of the park more in depth. That’s what I did! However, it is hard to concentrate in one area knowing that there are so many great features to see and areas to explore. I had crossed the United States from New England to the Southwest and Southern California, and driven along the Pacific coast to the Pacific Northwest in roughly two months. Now it was time to head back east. I left Seattle to the Glacier National Park in Montana, knowing that the chances of camping and hiking were not that great due to wintry conditions. In Coeur D’Alene, Idaho, where I spent the night, I learned that some roads in the Glacier National Park were open. I also found out that a couple of campgrounds were open. Despite the uncertainties, I chose to take my chances. Driving across eastern Washington, through northern Idaho, and into Montana offers breathtaking views of mountains, valleys and lakes. If for anything else, if you love road trips, driving through that region is an experience of a lifetime. Coming from Idaho into Montana and heading northeast toward the Glacier National Park, the drive through the Flathead Nation territory is visually astonishing. The landscape stand like paintings in the horizon. 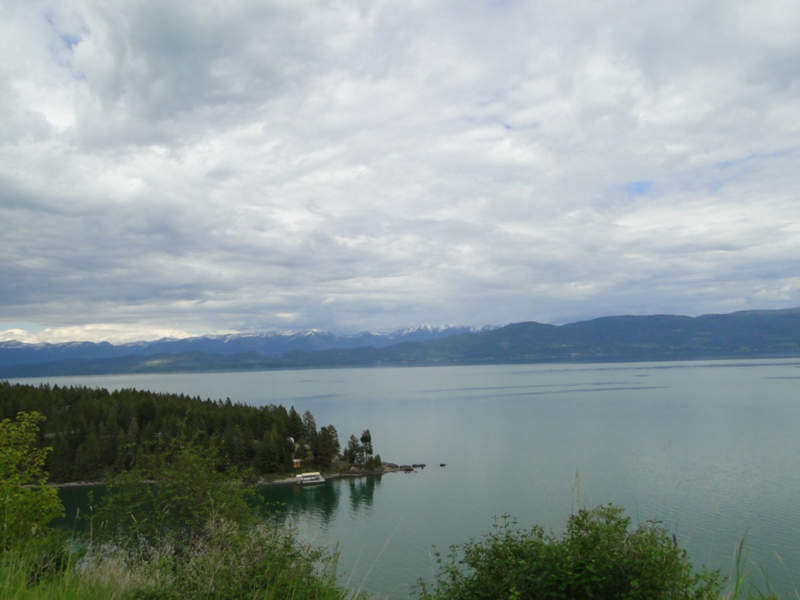 Passing by the Flathead Lake I could not resist not to stop alongside the road a few times to take in the breathtaking views in the Flathead Valley. 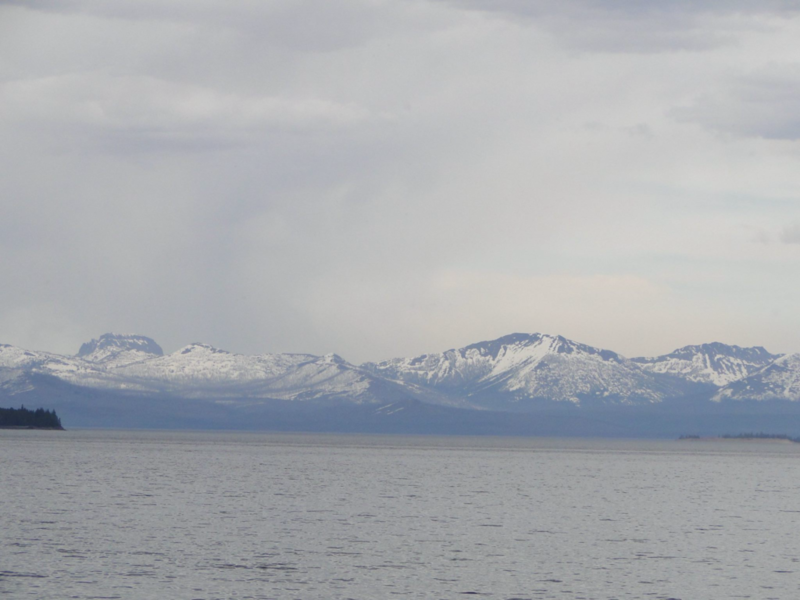 The Flathead valley gets its name from the Salish “Flathead” Indians who inhabit the Flathead Indian Reservation, which is located at the southern end of the lake. 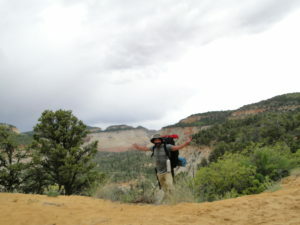 As I wrote in South Kaibab Trail – Grand Canyon, my exchange with a Hopi who spoke about his people and his ancestors was a turning point in the early stages of my road trip. In that article I described how my hiking and camping trip took on a more spiritual connection with the landscape around me. It was the moment when the soil and rocks underneath my hiking boots were more than a path; they were sacred grounds for American ancestral peoples. I drove up the mountain to enter the Glacier National Park through the west side. I still had a couple a few hours of daylight when I arrived at the park but there were no personnel at the park’s entrance. 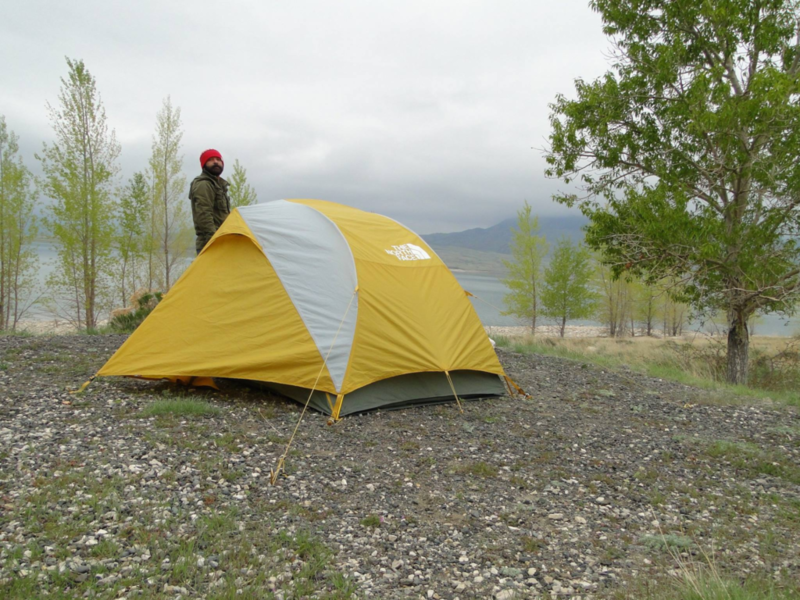 I located one of the open campground in the Lake McDonald Valley where I could pick a campsite and self register using the registration drop box. Perhaps, due to the weather conditions there were plenty of great open spots. I set up my tent, collected firewood while a couple black bears roamed the area. With everything set up for the night, I went for a hike to the landing area at lake McDonald. The view was spectacular despite the fact that it was overcast, gloomy, and cold. The still water in the lake mirrored the snow covered mountains at the far edge of the lake in a serene, peaceful setting. Lake McDonald Valley is the hub of activity on the west side of Glacier National Park. Once occupied by massive glaciers that carved this area thousands of years ago, the valley is now filled with spectacular sights, hiking trails, diverse species of plants and animals, historic chalets, and the grand Lake McDonald Lodge. The lodge was still closed for the season and except for a couple of fishermen at the landing on the lake shores, I had the lake to myself. 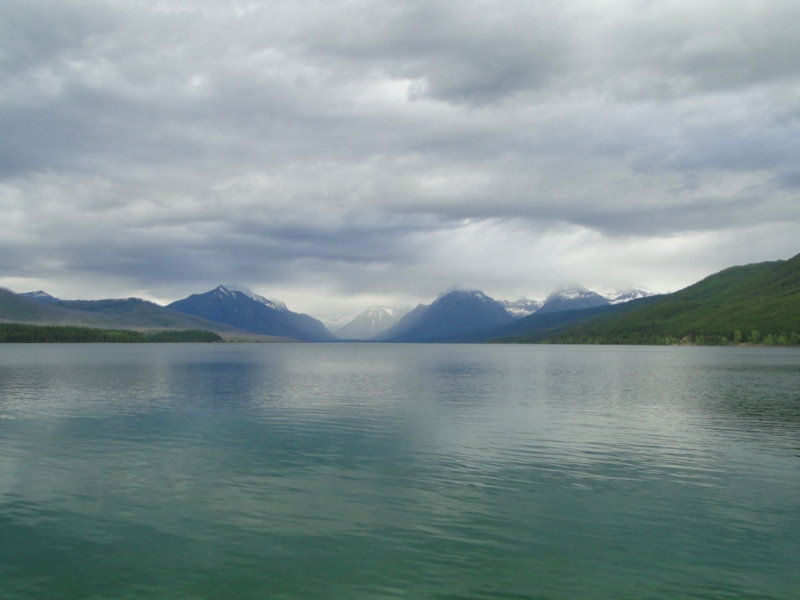 Ten miles long and nearly 500 feet deep (152.4 m), Lake McDonald, the largest lake in the park, is a direct result of glacial carving. High peaks surrounding the lake all show evidence of the power of glaciers to carve even the hardest of rock. The powerful glaciers that carved the broad “u-shaped” valley that Lake McDonald sits in also carved smaller hanging valleys with wonderful waterfalls that are accessible by numerous hiking trails. Hiking alone was not something that was advised. The guidelines for hiking at the Glacier National Park suggest hiking in groups of three people, as it is the case in many national parks. Besides the number of hikers guideline, the trails were mostly covered in snow with more storms in the forecast. When I returned to my campsite to stargaze by the fire, I noticed that I was no longer alone. A couple of guys had taken the site next to mine, although the distance separating the campsites are bigger than in many other parks that I have camped. It was not until the next morning that we spoke as they prepared to leave the park. They were from Minnesota, a place they recommended that I visit in the future. Perhaps because I told them that Minnesota is one of the only two states of the United States’ fifty states that I have not visited. My campsite neighbors from Minnesota told me to try and camp in the east side of the Glacier National Park because the views were far greater than the views in the west side of the park. They had just camped in the east side of the park and they told me that it was sunny with bright big skies. Since the weather was getting bad that morning with sleet and rain, I decided to dismount camp and head over to the east side, where I was promised bright, sunny blue skies. Located a half-mile west of the St. Mary entrance near St. Mary, Montana, about 33 miles northwest of Browning and less than 20 miles south of the Canadian border, St. Mary campground is the largest in the east side of the park and it was the only one that was open at that time. There was no vehicle restrictions, but driving up over the Logan Pass was a bit trick. In the few miles that separate Browning from St. Mary, I experienced all different types of weather conditions. First, sunny and clear in Browning. Then, flurries that turned into large snow flakes in the size of a golf ball, rain that turned into sleet and ice, and temperatures that dropped more than 20 degrees in just a few miles. Strong winds and densely foggy conditions made the drive up to St. Mary very dangerous. Not surprisingly, I was the only driver on the road to St. Mary. Arriving at St. Mary visitor center, I was informed that camping was not recommended due to a major snow storm on the way that night with the possibility to continue on for the following days. However, the park ranger told me that if I chose to stay and camp for the night he would allow me as long as I had food supply for five to seven days. He explained that at that time of the year they do not rely on weather forecast so much because the weather conditions can rapidly change. He was not sure what was going to happen and the pass could be closed for days if the storm became a major storm. With all that in mind and the fact that except for black and grizzly bears, the campground was empty, I decided to turn around and spend a couple of days in Browning. On my way down to Browning it was snowing heavily in the higher elevations with light snow in valley. The news the following morning was that three feet of snow had fallen in the mountains overnight. One of the reasons I wanted to stop by in Browning was to visit an old friend from my college days who was living in Montana and teaching at the Blackfeet’s school district. However, as I turned up in Browning earlier than I had planned, I missed visiting my old friend from New York. The day I arrived he was involved with organizing a field trip with his students to the great plains for the big event that was about to take place. Then he and his wife were heading to Helena to celebrate their wedding anniversary. Nonetheless, my stay in Browning was productive and educational. I learned a lot about the history of the Blackfeet and part of the history of the colonization and expansion into the West. It was a complete coincidence to have arrived in Browning just before the return of the buffalo to the plains. More than one hundred years after the disappearance of the buffalo from the plains, as a gift from the Canadian government to the Blackfeet nation the buffalo was being reintroduced to the Blackfeet territory in Montana. The event was being celebrated the following day after my arrival in Browning. Bus loads of school children were taken to the plains to witness the event. I would not have known about the magnitude and importance of the event if I had not overhead two journalists interviewing a Blackfeet chief at the Museum of the Plain Indians. He was probably in his eighties and he had many stories to tell. They were stories he heard from his grandmother and other elders when he was a child. They were fascinating stories that covered the period circa 1870 when the buffalo extinction took place. On my way to Bozeman, the drive was relaxing. It seemed that I had the road all to myself and the sunset in the big sky resembled paintings on canvas. The only difference is that this was a gigantic canvas extended in the big open skies. I had made peace with the fact that the heavy Winter that had prolonged well into mid Spring became a spoiler to my plans. However, it did not mean I was going to interrupt my road trip. All there was to it, was that I had to adapt and change plans according to mother nature’s unpredictable ways. The Glacier National Park was the last of my destinations in the northern part of the country. I had decided that from there I would head south to Utah and into Arizona for the following couple of weeks to avoid the extended forecast’s prediction of rain and snow storms in the north. I was getting tired of hearing from locals that “this is unusual for this time of the year.” However, I still had to put up with at least one more week of rain. 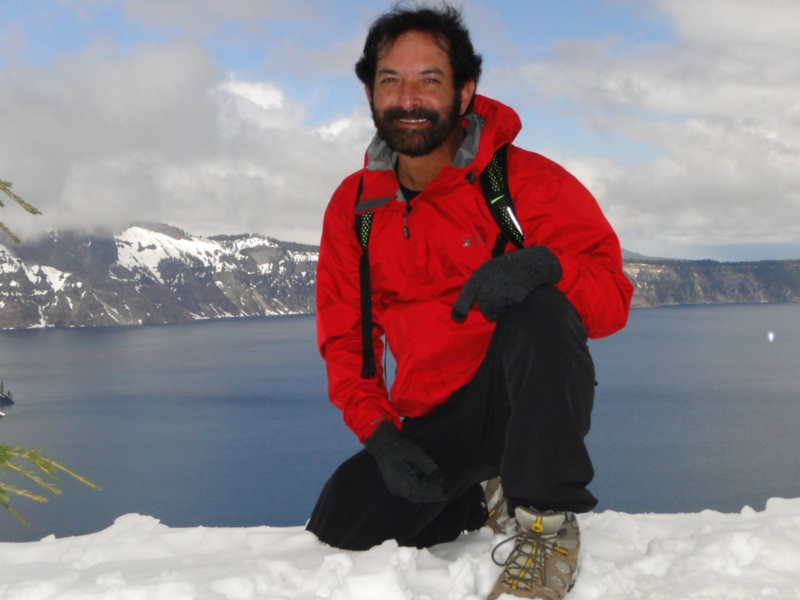 When talking about types of hikers, the list can vary from three to eight distinct types. However, it is the first four types of hikers that I look at as pertaining to the main hiking groups. Very often, a trail or portions of a trail will host all four types of hikers. 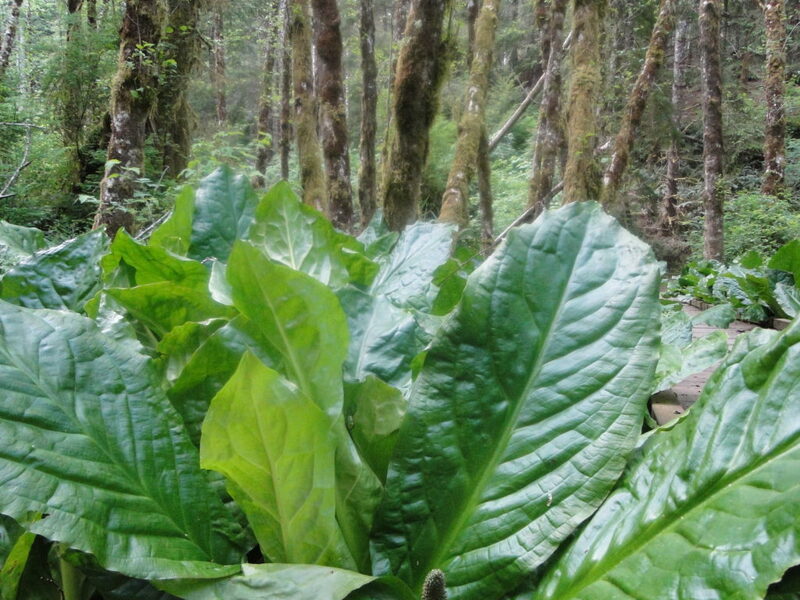 The Hoh River Trail in the Olympic Peninsula is not an exception to that rule. Actually, the trail itself can be classified as mostly flat and easy, except in the Winter and early Spring when events during the Winter can add obstacles to the trail. 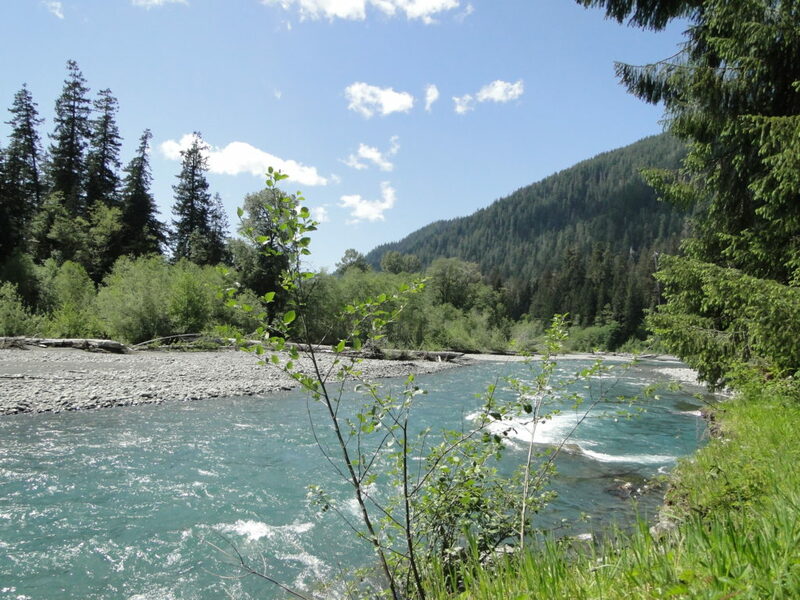 At least three of the main four types of hikers; the day hikers, the weekend hikers, and the distance hikers may share the Hoh River Trail in its first five miles. The largest group is the day hikers: they arrive in busloads and tend to crowd the first two and a half miles of the trail up to the Mineral Creek Falls. This portion of the trail, from the visitor center to the falls, is pretty flat. The trailhead is located at the Hall of Mosses where most of the visitors to the park will spend their time. 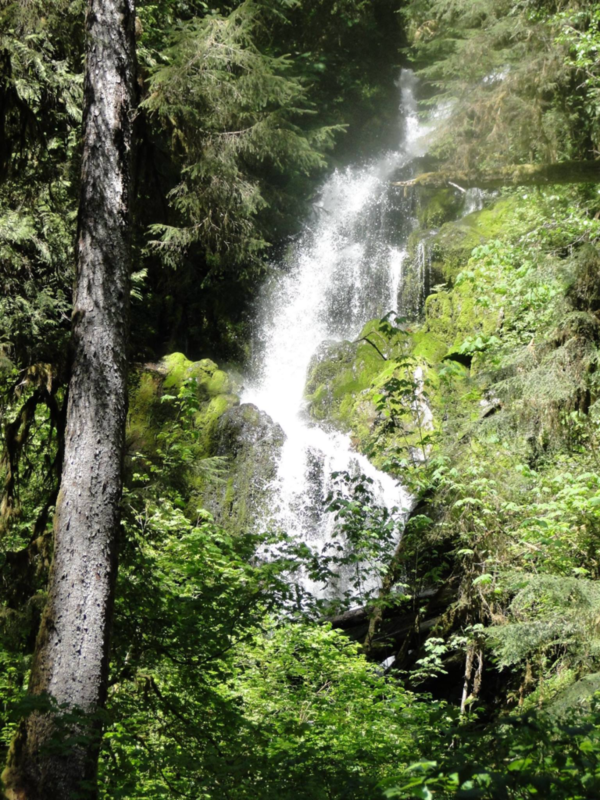 Some will stretch their ‘walk in the park’ to the Mineral Creek Waterfall and fewer will reach the Five Mile Island. Needless to say, the small bank of sand in the middle of the river gets its name because it is located at five miles from the visitor center. Just a handful in the first two types of hikers will venture farther than the Five Mile Island. 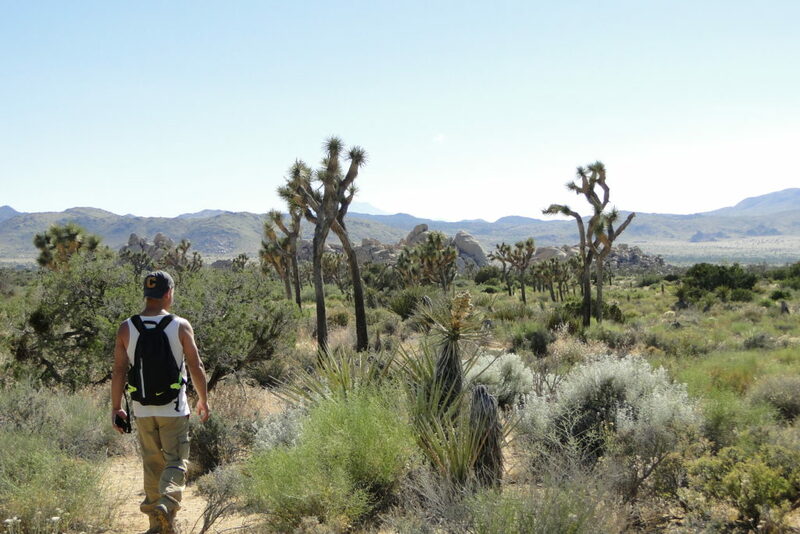 Day hikers are the most diverse and colorful group and their attire may range from casual shirt to shorts, tank tops, one 16 ounce bottle of water and no backpack or proper hiking gear to the more professional hiking wear. Depending on the trail and parks regulations, they may bring their pets and it can involve friends and family, ranging from toddlers to elders. Thus, the closer you find yourself to the trailhead, the more day hikers you will encounter and I guarantee it will be louder. There is no solitude at this portion of a trail. The second group is the weekend hiker, which by definition will spend two to three nights on the trail, but distance is not necessarily what defines this group. Weekend hikers may hike just a couple of miles to a campsite and settle there for one, two, or three nights to enjoy the ‘outdoor living’ away from urban living for the weekend. Or, they may hike longer distances to a more secluded campsite. While settled in a campsite, they may do day hikes each day to explore and experience different trails in the area. This type of hike is popular with small groups of friends with varying hiking skills and young couples. Distance hikers is the third group. This type of hike gets a tad trickier because it involves more planning, a certain degree of experience, and gear. Distance hikers seek the solitude away from the crowded and loud trailheads, experiencing amazing places and sites few will ever see. This is the type of hiker I considere myself to be for most part. It is certainly my favorite type of hike. Whenever I set foot on a trail, I always look forward to get through the first couple of miles as fast as I can. Leaving behind the first two types of hikers and begin to enjoy the peace and quiet that I seek when I hike is always my top priority. The fourth group, the through hikers, is the so- called ‘nomads of the trail’, or the ‘bushy beards’. These are hikers who will remain on the trail, away from civilization for extended periods of time. Often this group takes on a more spiritual nature of solitude. 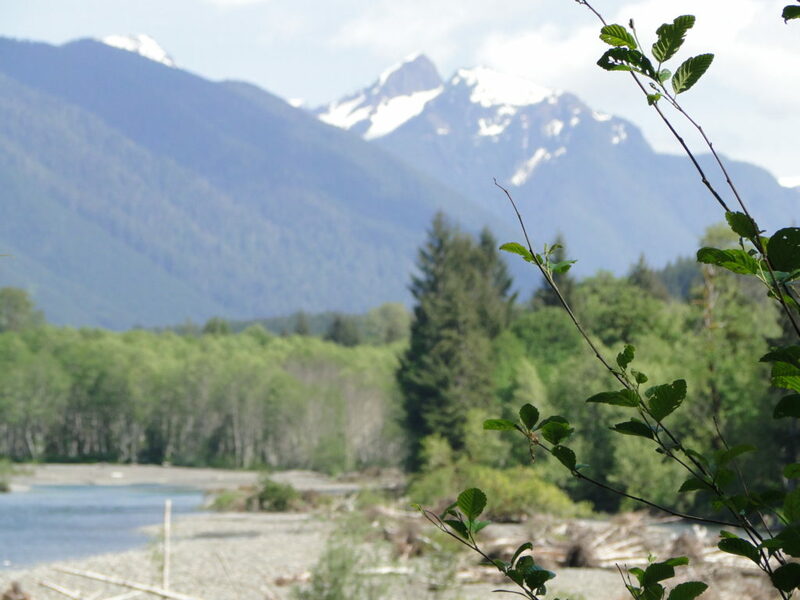 By the time I reached the Olympic Peninsula, I had been on the road for over two months. Although I had not been hiking consecutively on a single trail or trail network, I had spent most of the time on hiking trails. With a few day hike exceptions, I had done a quite a few backcountry hiking, camping at large for three to five days stretches. The lines between distance hike and through hike were getting a little blurred. I certainly had gained the nickname of ‘caveman’ because of my ‘bushy beard’ which was a far cry from my corporate, clean-cut look my friends back in New York were accustomed to. At that point I had hiked more than a couple of hundred miles and spent most of the time in the wilderness. I left the campsite at the visitor center early in the morning to beat the arrival of the day hikers at the Hall of Mosses. It was a beautiful day at the visitor center. The sun was shining and the temperatures were expected to reach the mid seventies. 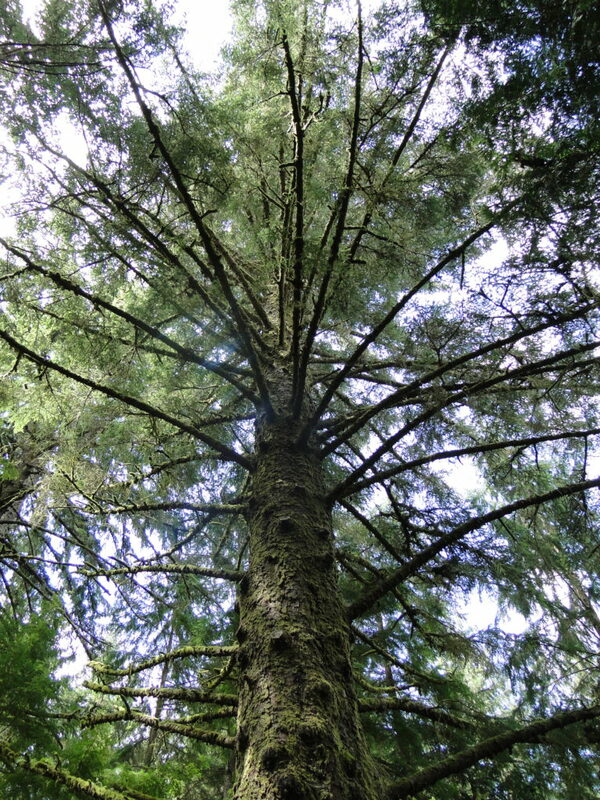 However, once on the trail lined with giant cedars, spruce, fir trees and endless ferns, it is almost impossible to see the sun above. For most part, this trail immerses in the true rainforest experience. The caveat at that particular time of the year was that being in the early days of Spring, after a long, harsh Winter, the trail passed the Five Mile Island had not been used enough and debris brought down by the Winter storms had not yet been cleared. I had been warned that the park rangers had not made to the Blue Glacier yet and the conditions of the trail was unknown; reason why the ranger station was not issuing permits for camping beyond the Lewis Meadows campground located at 10.3 miles from the visitor center. Up to the Five Mile Island the hike was relatively easy. Only just over five miles separated me from the Five Mile Island to the Lewis Meadows campsite. Nonetheless, the five remaining miles became exponentially more difficult each mile I conquered. The obstacles were increasingly challenging. Speaking of solitude, on my way up passed the Five Mile Island, I bumped into a group of three young ladies who were returning from their overnight camping. We chatted for a few minutes, enough for them to tell me how gruesome the trail ahead was. 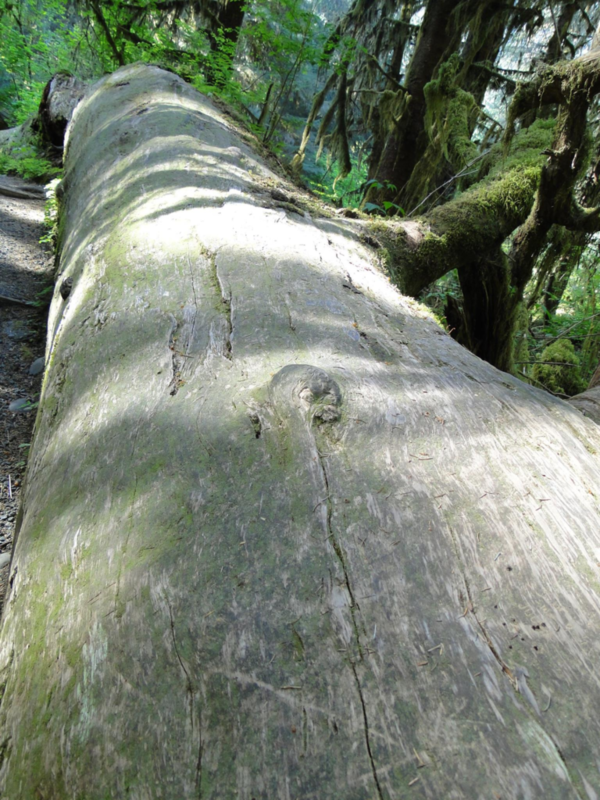 Hundreds of trees that had fallen over the trail were the most common hurdle. At some of the fallen trees, I had to go under, over, or around them. Going under or over them was quite difficult because of the weight of my backpack. Going around trees that measured up to a hundred feet kept adding to the distance. Besides, going around the trees meant getting off the trail and braving the overgrown vegetation. Perhaps the trickiest aspect of the trail at this portion was not being able to discern where the trail was at all. There were portions of the trail that due to the amount of fallen trees or branches of trees, was difficult to determine if I was still on the trail or not. However, the absolutely challenge was crossing the creeks! The bridges had all been washed away during the Winter, which meant crossing the creeks in the water bed. At each creek crossing, that in certain cases meant crossing more than thirty feet in the water bed, it was hard to find where to get on the trail on the other side. Some hikers had marked the trail on the other side of the creeks with stone markers, but even those markers were hard to find. In certain cases there were multiple markings which made it more confusing. After crossing the first creek and getting my feet wet in waters at temperatures in the thirties, hiking and carrying a heavy backpack became more and more a grueling task. My backpack was a little heavier than what should have been and the culprit was my military sleeping bag. After spending two nights at Lewis Meadows, feeling rested, it was time to hike the ten miles back to the visitor center where I had left my car. During the couple of days spent at Lewis Meadow, I only saw five people. A group of four guys were camping on the opposite far end of the meadow and we never spoke. Another hiker came in on the first day right after I set up my tent. He had attempted to do what I had planned to do; to try and hike as far as I could toward the Blue Glacier, as suggested by the ranger at the visitor center. That hiker told me that he went as far as just a mile to realize that it was too risky to try and advance farther up. He told me that the amount of accumulated snow made it impossible to tell where the trail was and the risk to fall into deep creeks or holes was too high. 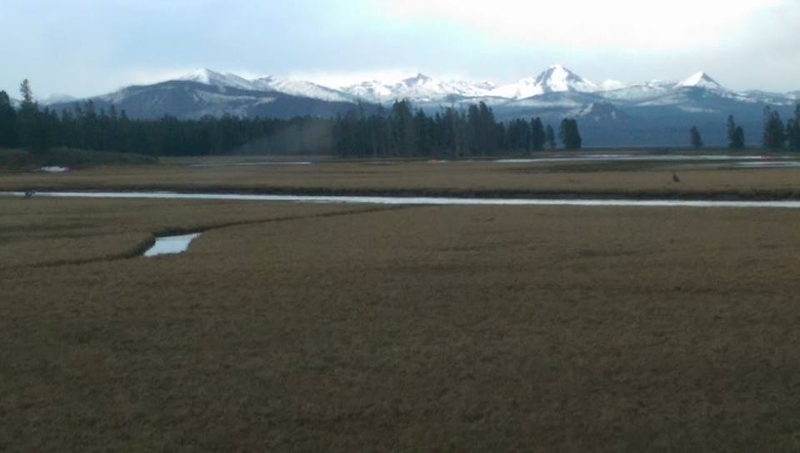 Coming from a much more experienced hiker of the Olympic Peninsula trails who was not only a native to the region but who also worked for a wildlife protection organization, I decided to follow his advise and return from the meadows. It was a cold morning on Sunday, Mother’s Day. I got up at five hoping to reach the trailhead by no later than ten. I would call my mother as I regained telephone signal and drive back to Seattle. I hiked 10.3 miles that morning without meeting anyone on the trail! All types of hikers were absent! After a couple of days in Seattle, Washington, it was time to get back in the wilderness. Surprisingly, the weather was better in the Olympic National Park than in the city of Seattle. I arrived at the Olympic National Park to temperatures above eighty degrees, and blue skies. Leaving Seattle around eight o’clock in the morning, it was a nice drive up to the Olympic rain forest. Having visited the Hoh Rain Forest in the years that I lived in Seattle in the mid nineties, I was in familiar territory. Great memories from past visits and a sense of ‘returning home’. A couple of miles before entering the park, I stopped for firewood and coffee. What a great surprise! It was the best cappuccino I got in over a month on the road. I had not made a reservation for a camping site close to the visitor center adjacent to the Hall of Mosses, and I was lucky to get a permit to camp there overnight. With a camping permit, I drove around the campground hoping for a site by the water. After looping around a couple of time, I spotted a couple leaving from a campsite that had absolutely the best view. They told me that they were not camping there; they had just been sitting there having a picnic lunch. When they apologized for sitting at the site, I told them that I was so grateful for they having held the best spot by the Hoh River for me. Otherwise, it would have been taken. Location is everything! Looking at Mount Olympus covered by snow on a clear day is an overwhelming sight. Getting to its summit is a dream of hikers and climbers. I thought I would attempt to reach the Blue Glaciers, but I soon found out that it would not be possible. When I tried to get information on how to get the wilderness camping permit, which should be obtained in person in Port Angeles at the Olympic National Park Visitor Center, I was told by the park ranger that they were not issuing permits for camping above Lewis Meadows. She told me that they had the more snow fall in that Winter than they had in any year of the past fifteen years. She also told me that the rangers had not made to the Blue Glaciers yet because most of the trails were compromised by washed out bridges, erosions, and fallen trees. 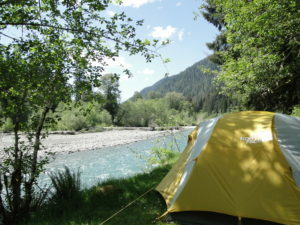 She suggested me to get a camping permit from her, to camp at Lewis Meadows which is located along the river at 10.5 miles. From there, she advised me to try a day hike as far up I could safely get. Putting in perspective, the summit of Mount Olympus is at 17.3 miles on the Hoh River Trail. Obviously, the closer to the summit, the more difficult. 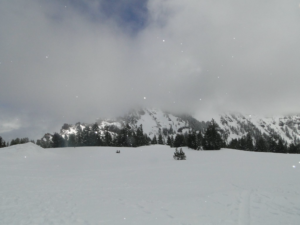 In the Spring and early Summer, steep snow slopes are found along the Hoh River Trail between Elk Lake and Glacier Meadows. Until early Summer, ice axe and crampons may be required and good handling of map and compass is needed because parts of the trail may be covered in snow. The ranger told me that although we were already in the Spring, avalanche chutes were hazards making it a risky for even experienced hikers and mountaineers. Knowing that the best safety tool is common sense, I knew that I could only attempt to get to the Blue Glaciers. However, at the ranger station I was warned that not even that might be possible because the rangers had not been there yet. The ranger who I spoke with had not spoken with any hiker who may made it that far up. I decided to go for a walk in the Hall of Mosses Trail, which despite being a loop trail just 0.8 mile long, offers spectacular views of gigantic trees covered in mosses. This area can be crowed because it is a short, ease trail that most of the visitors to the park are able to hike. Many visitors complain that it is too crowded and it takes away the magic of the forest. It is true that many visitors enjoy the fact that the trail is easily accessible and it is not a challenging hike either. However, it can get crowded! An early hike, around seven in the morning, is the best way to avoid the crowd. Unfortunately, some visitors ignore the fact that silence is important to enjoy the sounds of the forest, and one can get stuck with loud groups that can be heard from yards away. I was lucky! I only encountered a handful of people on the trail, perhaps because it was sunny and warm. Many people prefer to visit the Hall of Mosses on cloudy, foggy days. They say it is more magical. I have walked through the Hall of Mosses in cloudy days, foggy days, rainy days, and sunny days. Although I enjoyed every time I visited, under different weather conditions, I liked finally walking through the forest in a sunny day because the bright light filtered through the canopies highlighted the vitality of so many shades of green. The Hall of Mosses Trail elevation is only about 100 feet, and after an initial elevation the trail flattens. 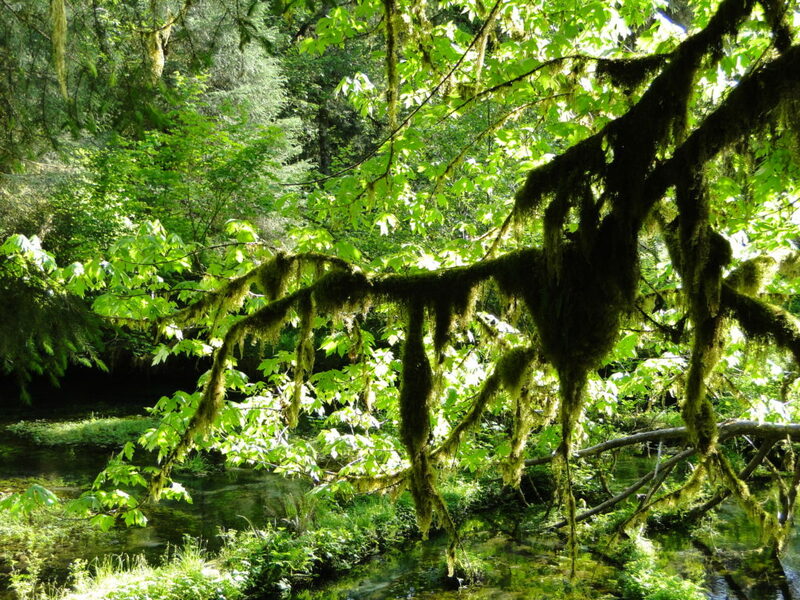 The trail is lined with old trees, mostly big leaf maples and Sitka spruces draped in moss.Considered the only rain forest in North America, the rich ecosystem form the perfect habitat for several species of organisms that sustain the balanced environment of the forest. 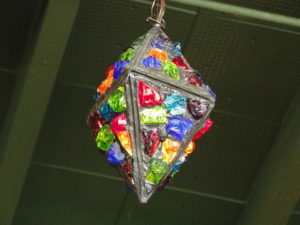 Fragile, yet rich! Its uniqueness resides in its life cycle where fallen trees become ‘nurse logs’. 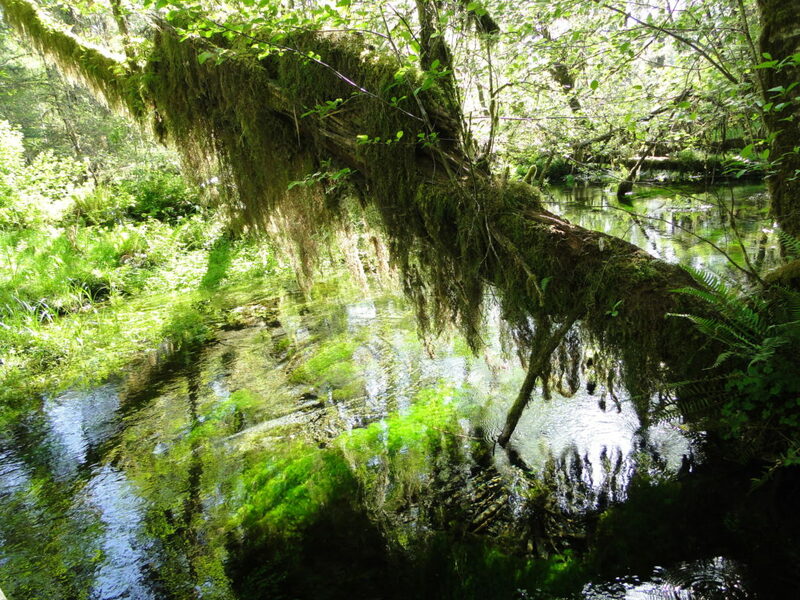 The Hoh Rain Forest receives up to 14 feet of rain per year. My campsite’s location was superb! 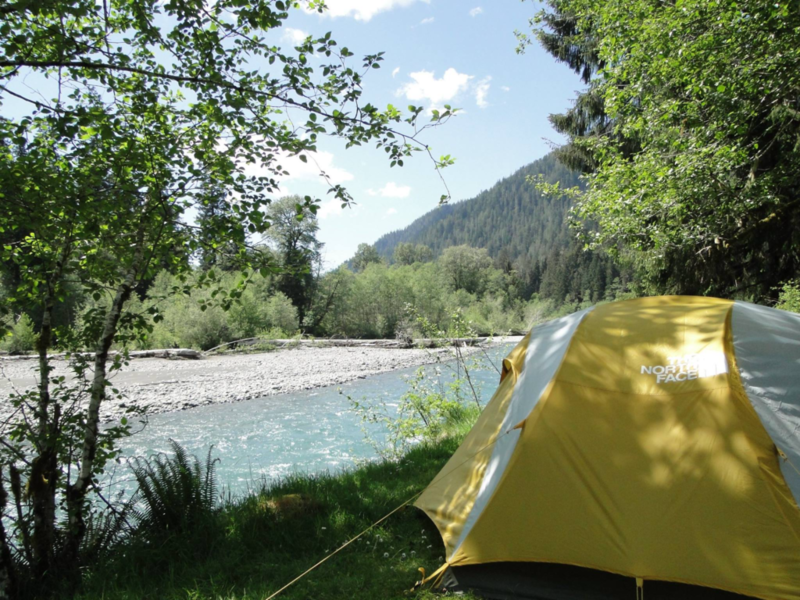 I fell asleep to the sound of the waters rolling on the shallow bed of the Hoh River. My tent was less than 10 feet from the water. After spending a couple of hours stargazing by the fire, as I laid down in the dark made me feel as if I were surrounded by the water or in the middle of the river. If I kept my eyes open, I could still see the stars through the tent. That’s how bright the stars appeared above. I knew that I the ten mile hike to Lewis Meadows ahead of me the next day was going to be difficult. I had to get a good night of sleep and be ready in the early morning. 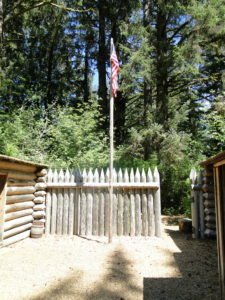 Before leaving Oregon to Washington, I would make a day stop at Fort Clatsop. The fort that was the winter encampment for the Corps of Discovery from December 1805 to March 1806. 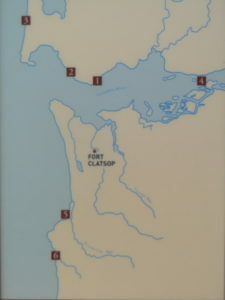 Fort Clatsop is a unit of the Lewis and Clark National and State Historical Parks where the trailheads for the Fort to Sea Trail and Netul Trail are located. And just to make it clear, because I have been asked before if I would hike the Lewis and Clark trail, one cannot hike such trail because the Lewis and Clark Trail voyage of exploration was mostly done via waterways. 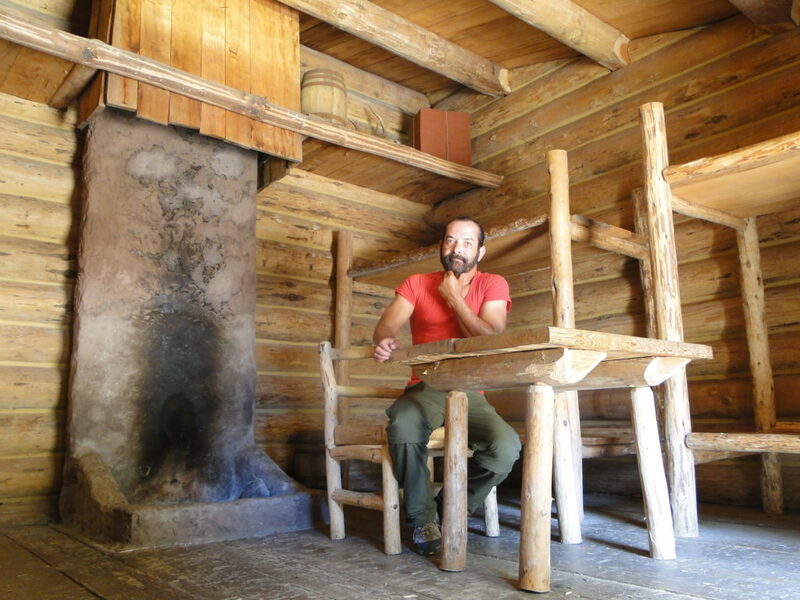 However, one can hike the trails that were created to access supplies to maintain the needs for the daily life of the fort inhabitants. The day before heading to Fort Clatsop, I spent a quiet day in Astoria, Oregon. My day began with an interesting, exciting surprise encounter at a café in Astoria. After looking online for a local place to have brunch, based on reviews and recommendations I decided to go to the Astoria Coffee House and Bistro. The coffee house was busy when I arrived and because I was by myself, the hostess asked me if I wouldn’t mind to sit at the bar because otherwise the wait time for a table would be close to an hour. Not only I agreed to her suggestion, I preferred to sit at the bar because I wouldn’t like to sit at a table by myself. Someone sitting across the bar caught my attention because of his attire. His outfit seemed to be from the 1920s or 1930s. Also, he looked familiar to me. Being so far away from home in New York, I did not think that I would bump into someone I knew and quickly the possibility that I knew that person. He was with to other people with whom he was having an animated conversation. His laughter was adorable and captivating. The bartender at one point leaned toward me asking me if I recognized the young man across the bar? As I responded that he did look familiar but I did not think I knew him, she said “yes, you know him! That’s Elijah Wood!” Oh my God! It was him! I was having breakfast a few feet away from my idol from the Lord of the Rings! And yes, I was dying to go ask him for a selfie, but I am too shy for that. Just when I was leaving the coffee house, he returned by himself and left again only to disappear in the quiet streets of a Sunday morning in Astoria. By the way; breakfast was fantastic and probably the best Bloody Mary I ever had. 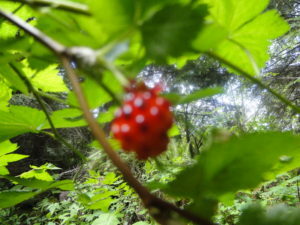 On Monday morning I took my tent down, packed and left Fort Stevens to Fort Clatsop for a visit of the Lewis and Clark Fort and day hike of the Netul Trail and a portion of the Fort to Sea Trail. The visit to the fort was educational, rewarding, and relaxing. There wasn’t a lot of visitors on that day and the park was quiet and peaceful. Seeing firsthand the fort installations and learning about the challenges of living in the fort during the long Winters of the Pacific Northwest, sitting on the beds that Lewis and his expedition crew once occupied was an incredible experience. The fort which is kept in incredible conditions 200 years later, offers an insight in the history of the mission of exploration, study, and expansion of the continental United States. The Lewis and Clark Expedition that began in May 1804 reaching the Pacific Ocean in September 1806, known as the Corps of Discovery Expedition, was the first American expedition to cross what is now the western portion of the United States. It began near St. Louis, made its way westward, and passed through the continental divide to reach the mouth of the Columbia River in the Pacific Northwest. The Corps of Discovery comprised a selected group of U.S. Army volunteers under the command of Captain Meriwether Lewis and his close friend, Second Lieutenant William Clark. Having Clark in the expedition was one of the conditions imposed by Lewis to accept leading the endeavor presented to him by President Jefferson. William Clark resigned his commission on July 4, 1796 and retired due to poor health, although he was only 26 years old. He returned to Mulberry Hill, his family’s plantation near Louisville. In 1803, Meriwether Lewis recruited Clark, then age 33, to share command of the newly formed Corps of Discovery. A slave owner known to deal harshly with his slaves, he brought York, one of his slaves, with him. 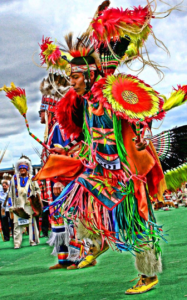 The indigenous nations treated York with respect, and many of the Native Americans were interested in his appearance, which “played a key role in diplomatic relations”. Although Clark was refused a promotion to the rank of captain when Jefferson asked the Senate to appoint him, at Lewis’ insistence, he exercised equal authority, and continued the mission. Clark concentrated chiefly on the drawing of maps, the management of the expedition’s supplies, and leading hunting expeditions for game. President Thomas Jefferson commissioned the expedition shortly after the Louisiana Purchase in 1803 to explore and to map the newly acquired territory, to find a practical route across the western half of the continent, and to establish an American presence in this territory before Britain and other European powers tried to claim it. The campaign’s secondary objectives were scientific and economic: to study the area’s plants, animal life, and geography, and to establish trade with local Native American tribes. With maps, sketches, and journals in hand, the expedition returned to St. Louis to report its findings to Jefferson. An interesting anecdote and aspect of the expedition is that when Lewis and his men reached the Pacific Ocean, only half of the expedition mission was completed. According to President Jefferson, the other half was to make sure that all the discoveries, diaries, and notes were brought back to him. 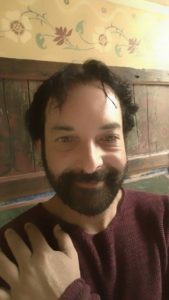 After two months on the road and hundreds miles of hiking, my hair and beard had grown and friends back home were starting to call me the ‘mountain man’ and ‘caveman’. I had shed any fat that I may have had in my body. At that point I had to make a stop at REI in Portland to purchase new hiking pants because my waist had gone down to a mere 26 inches. The planned road trip route was now in question due to the weather conditions in the Pacific Northwest’s National Parks. Before crossing the state line into the State of Washington, the last stop in Oregon was mainly cultural and recreational for me. The visit to Fort Clatsop fit in that category, but I could not resist the temptation to hike a few miles that day. 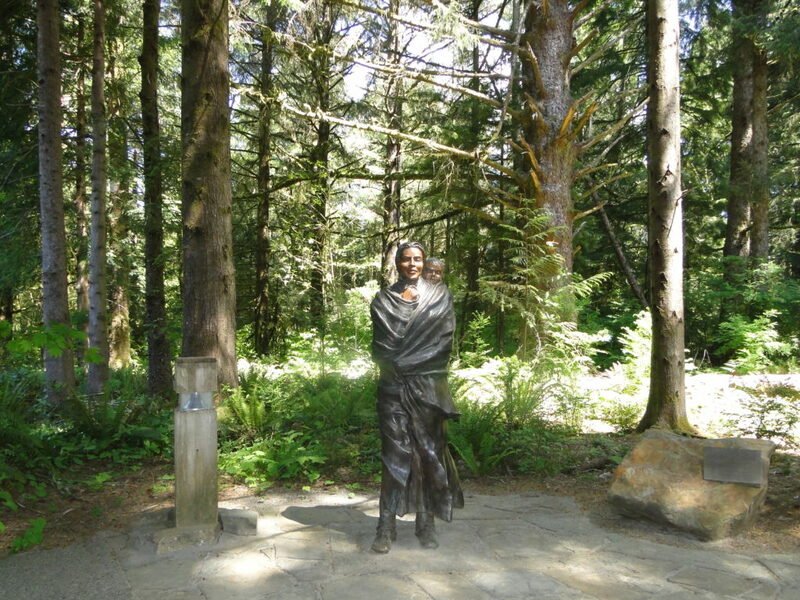 I started by hiking the 1.5 mile Netul River Trail southbound from Fort Clatsop to the Netul Landing, which marks the final landing of one of the final destination branches of the Lewis and Clark expedition. The graveled trail that runs along the river is a flat, ease terrain which is used by most of the visitors to the fort. On that morning, I encountered a few of the visitors while hiking the Netul Trail which connects to the 6.5 mile Fort to Sea Trail, which is a lot more challenging trail. On this trail a higher hiking skills level is required as portions of the trail has abrupt elevations followed by sudden drops. In other words, it is full of ups and downs! The round trip to the sea is 13 miles. This was the trail used by the fort residents to reach the pacific on their fishing trips in the Spring and Summer when they stored food for the long Winter. The Fort to Sea Trail winds past forests, coastal bogs, farms, an active military training center and crosses a mini-version of Portland’s Fremont Bridge before reaching Sunset Beach State Recreation Site. The crossing of U.S. 101 in via an underpass. With one end on federal land and the other on state, and with other land holders in between, the trail is a metaphor for what makes the Lewis and Clark park unique in the Pacific Northwest. The vegetation here is abundantly green and full of vitality. 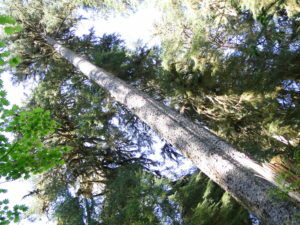 With part of its natural trees reintroduced to recreate the original habitat after the ending of the logging industry, the park’s forest is managed by both the National Parks Service and State Parks. It was quite late in the day when I returned to the fort. I was exhausted because in order to complete the day’s 15 miles hike I had to keep a fast pace. However, I still wanted to get to the Puget Sound area in Washington, about four hours away if I stopped at least once for a thirty minutes break. Although I had no intention to spend too much time in Seattle, I wanted to visit a couple of friends in town. As I crossed the state line into Washington, there was still some daylight left and the driving conditions were good. At one point I came into a foggy and rainy area, reminding me that I had reached the Pacific Northwest. From this point on, relying on weather forecasts was just as suggestion. Being close to a rain forest where weather conditions can and do change suddenly, and can display different patterns in just a few miles due to different altitudes and other variables, would almost certainly bring a few surprises. Nonetheless, I felt that I was prepared to adjust my plans and adapt to nature’s whims. Before moving to New York, I had lived in Seattle for five years and I was accustomed to the weather in the Pacific Northwest. It was past ten when I arrived at my friend Raquel’s house about thirty minutes southeast of Seattle, where I would spend a couple of days catching up and taking a break from the woods. Destination, Fort Stevens! My last camping and hiking spot in Oregon before crossing over to Washington, was a relatively short drive away from Portland. I was looking forward to camping and hiking on the Oregon shores for a couple of days. I had not been camping nor hiking since I had left Point Reyes four days earlier. On that Sunday morning, the sun was out and it was a beautiful day for hiking. The weather forecast for the next few days was perfect! However, the tiny itchy spot on my eyelid had now swollen and it was making it difficult for me to drive, as my left eye was half shut. Before looking for medical help I had to check-in and set up my tent. Being that it was a Sunday, I had to look for a clinic or go to the emergency room. I arrived at Fort Stevens around two in the afternoon. After setting up the tent I drove to the town of Astoria hoping to find a clinic, but because of being Sunday all I could find was a sympathetic pharmacist who told me not to go to the emergency room. She advised me to wait another day or so because she said that the center of the boil was about to pop! Returning from Astoria, I found the campsite invaded by an army of mosquitoes. The firewood supply man drove by and I made sure I would have plenty to burn to keep the insects away! I even sprayed the outer tent with repellent to try and keep them away. After make preparations for the evening, I hiked to the beach to watch the sunset. The wind brought ashore a cold breeze. It was, in fact, quite cold! However, despite the cold the crowd was growing rapidly. They came prepared! Most of the sunset watchers brought blankets and were dressed for cold weather. A photo shooting that had been taking place by the Peter Iredale wreckage was reaching its climax. A few photographers were setting up their equipment at strategic locations on the beach and on the dunes. Fort Stevens was in operation for 84 years, from the Civil War to World War II. Today, this historic landmark in the Northwest offers camping, beach combing, fresh water and lake swimming, hiking trails, wildlife viewing, a historic shipwreck, and a historic military fort. Fort Stevens is unique and diverse. It’s unique because it is the only Civil War era earthen fort in the West Coast. It also has many early twentieth century concrete artillery gun batteries; including a rare battery that served as a command center during World War II. The park, which today has a network of 9 miles of bicycle trails and 6 miles of hiking trails in a diverse habitat of spruce and hemlock forests, wetlands, dunes, and shore pine areas, was named after Union Army Major General Isaac I Stevens. Major General Stevens was the first territorial governor of Washington, who died in 1862 at the Battle of Chantilly. 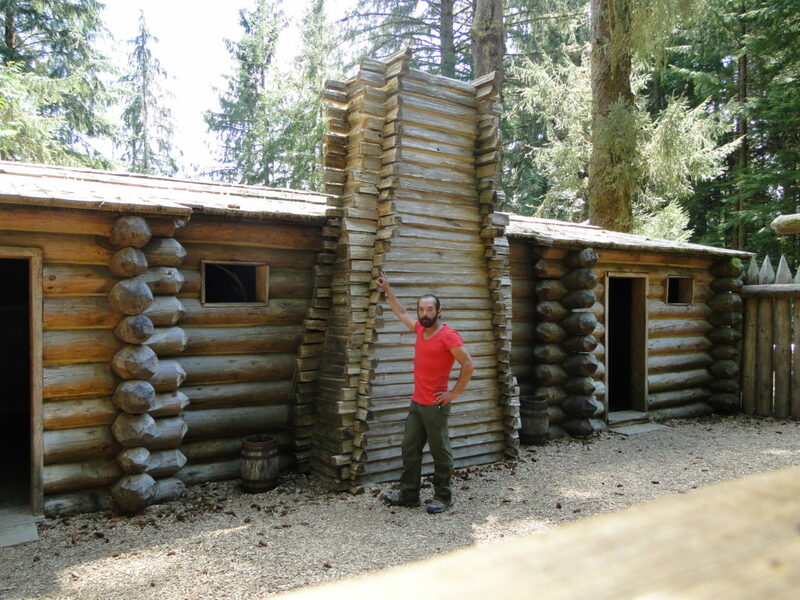 The original earthen fort was completed in 1865 to protect the mouth of the Columbia River from a possible British Army invasion from the north and from confederate gun boats from the south during the Civil War. A possible English invasion from Canada, in case the British joined the Confederate side during the Civil War, was seen as an eminent threat and Fort Stevens was an imposing line of defense. The fort became the only coastal defense during the Spanish-American War, World War I, and World War II. It also gained the distinction of being the only American military installation to have been attacked during time of war since the war of 1812, when on June 21, 1942 it was attacked by a Japanese submarine. 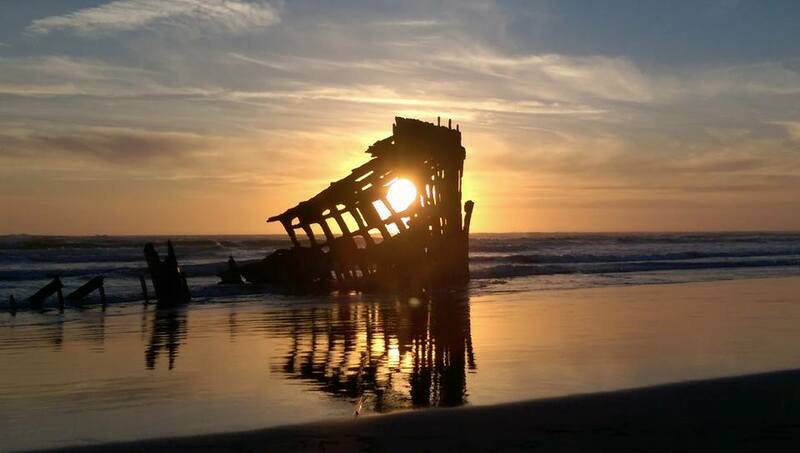 Slowly decaying and disappearing, the wreckage of Peter Iredale sits as a monument grounded on the beach creating a great background for photographers and sunset watchers. Having ran ashore on October 25, 1906, she was 285 feet long, four-masted steel bark sailing vessel. The Peter Iredale was built in Maryport, England, in 1890 and owned by British shipping firm Iredale & Porter. On September 26, 1906, the Iredale left Salina Cruz, Mexico, bound for Portland, where it was to pick up a cargo of wheat for the United Kingdom. Despite encountering heavy fog, they managed to safely reach the mouth of the Columbia River early in the morning of October 25. The captain of the ship, H. Lawrence, later recalled that, as they waited for a pilot, “a heavy southeast wind blew and a strong current prevailed. 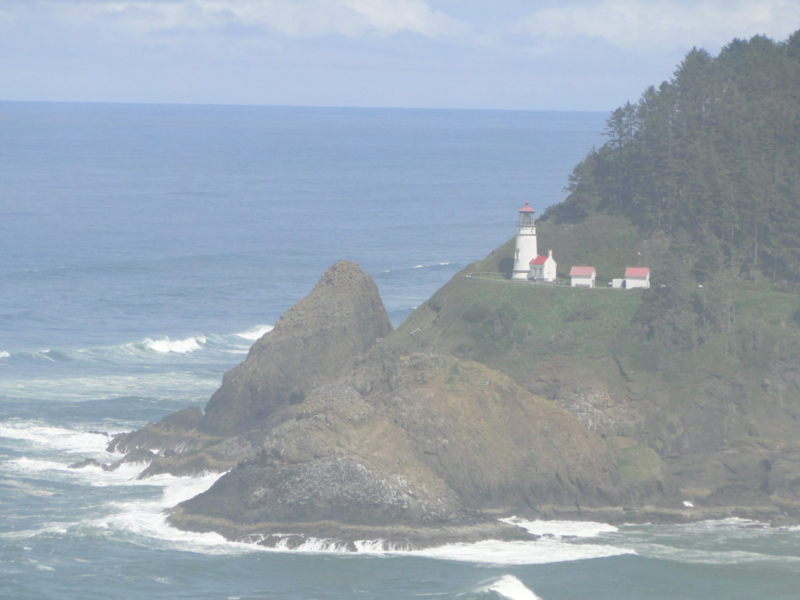 Before the vessel could be veered around, she was in the breakers and all efforts to keep her off were unavailing.” The Iredale ran aground at Clatsop Beach, hitting so hard that three of her masts snapped from the impact. Fortunately, none of the crew were seriously injured. Captain Lawrence ordered that the ship be abandoned, and rockets were launched to signal for help. The wrecked bark became an immediate tourist attraction. The day after the ship ran ashore the Oregon Journal reported that the wreck “proved a strong attraction…and in spite of the gale that was raging scores flocked to the scene of the disaster.” They noted that the Astoria & Columbia River Railroad was already planning to run excursion trains to the site. 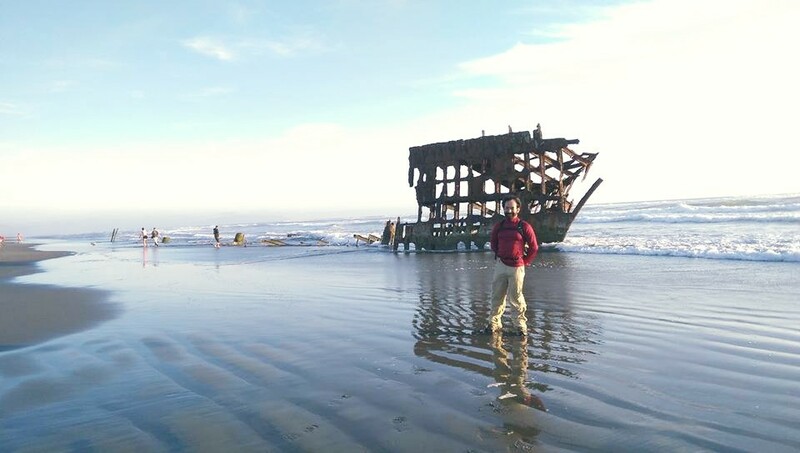 Although the ship has been broken up by wave, wind, and sand over the years, the wreck of the Peter Iredale continues to be a popular tourist attraction. It is the most accessible shipwreck of the Pacific Northwest graveyard. Undoubtedly, my favorite attraction. Perhaps, knowing that in a few years all that will remain of Peter Iredale are the photos and memories, I returned to the same spot a few times during my visit to the park to watch the sunset. Where to stay? Too many elements to consider when you look for a unique experience at a hotel. In Portland, it happened by accident or coincidence. I was supposed to have stayed just one night in Portland and move on the next morning. Since I began my road trip, it was my plan to avoid cities and focus on national parks. This was not meant to be a visit to urban areas; rather, it was about camping and hiking. Nonetheless, it turned out that I stopped by and stayed in a few cities because of how many hours I had been driving, or because there was not another option. Also, sometimes I needed to have good internet service, do laundry, and take care of other practical chores. A few times on the road I came to cities where I knew someone. In Portland I knew a former employee who had worked for me in New York. After my first night in town, I spoke with him early in the morning and he offered to reserve a room for me at his hotel because he wanted me to see where he was working. He thought that having worked in hospitality, I would enjoy staying at the Kennedy School. So, instead of move on I stayed a second night in Portland. He was absolutely right! What a unique experience! The charm of the hotel is in its simplicity and austere feel of an old school. However, it was the atmosphere created by a relaxed and genuine costumer service that made my experience exceptional. Now a hotel that houses a brewery, the Kennedy School had operated as an elementary school for over one-hundred years. After many years of abandonment, the old school was transformed into a hotel. One thing that makes it charming and unique is that it still looks and feels like a school, and preserves the history of the Kennedy Elementary School. Classrooms are now guest rooms. 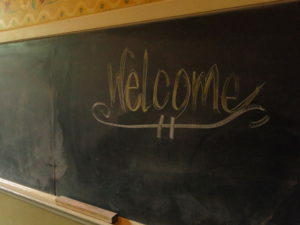 As I entered my room, the first thing I saw was the original classroom blackboard on which the word “Welcome” was written in chalk!!! Today this piece of rescued piece of Portland’s history, offers more than a classroom where you can comfortably sleep without being sent home with a note to your parents. And it is okay to have a beer or two in this old school! Today, the McMenamins Kennedy School houses a movie theater, a restaurant, a cigar bar, a small bar, a larger lounge, and a brewery. What really captivated me was the restaurant where I had a wonderful brunch before leaving Portland. 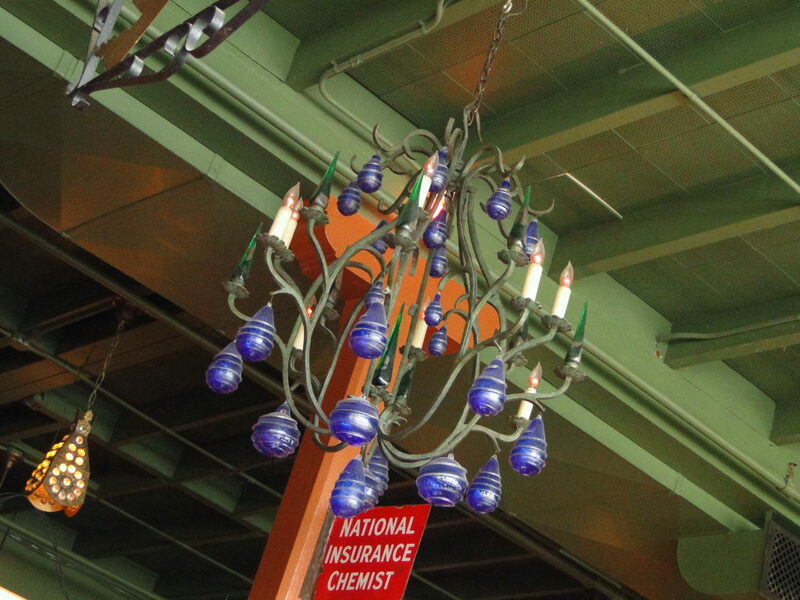 The decoration displays a collection of non-matching exotic lamps and other exotic objects. The waiters and staff do not wear uniforms and are encouraged to be themselves, bringing in their individual personalities. The unique experience made for a great way to start my day. There’s something very uplifting and motivating about an environment where people seem to enjoy what they are doing. hard to pick a favorite with so many never seen before designs and styles. Another feature of the restaurant are the old, comfortable mahogany booths. 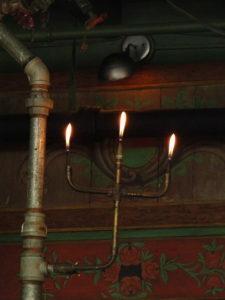 They transport you back in time and make you feel like are in the old childhood schools from the past. It does give a touch of distinguished character to the restaurant and to the experience of eating there, except for the beer that pours throughout this old school. The Courtyard also is unique for serving handcrafted ales brewed just a few steps away on the onsite brewery. In the age of “cookie-cutters” hotel chains that promises a unique guest experience but in the end turn out to be the same everywhere you stay, unique hotels are my favorites. It does not have to be the most luxurious hotel, nor the most well-known hotels. What really catches my attention is the uniqueness of hotels that have unmatched characteristics and appeal. Working in the hospitality industry, I heard too many guests ask “where am I today” because hotels that lack that unique charm and personality look exactly the same anywhere you stay. For frequent guests who travel on business for most part of the year, the standard design and décor of brand hotels may bring some comforting sensation of being at the same place day in day out. But, for the leisure traveler who wants to experience the uniqueness of each destination, historic and boutique art hotels have more to offer. 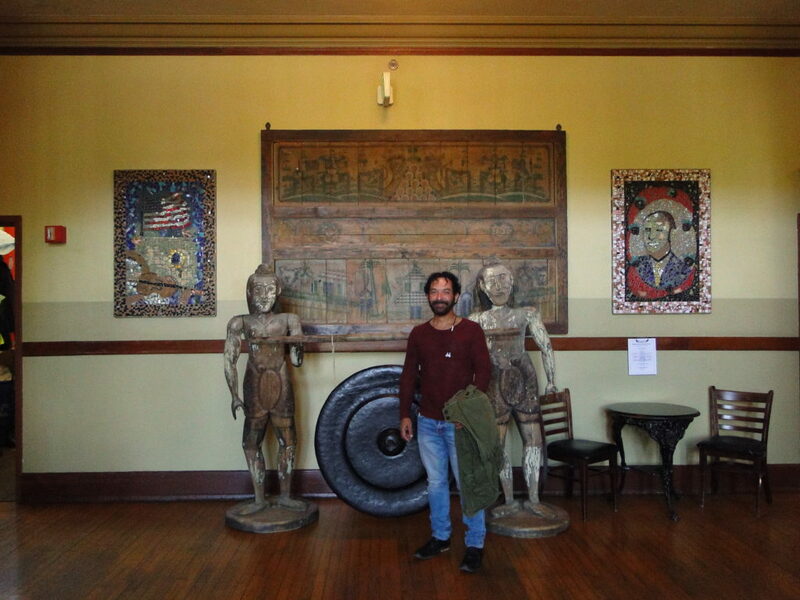 That was what my one night stay at the McMenamins Kennedy School in Portland was all about. There, not only the architecture of the building and its decoration make a clear distinction, but it spells out the character of Oregon! One of the hallmarks of Portland is the high concentration of breweries and its people’s love for great handcrafted beers. At the McMenamins Kennedy School, the passion for beer takes center stage! Another feature of the McMenamins Kennedy School, is the soaking pool. Guests have complimentary access to the soaking pool, and the public can also have access to it for a fee. Surrounded by gardens, the soaking pool is a relaxing treat to be enjoyed. It is located in the old Teachers’ Lounge and it is decorated with multi-colored ceramic tiles. After relaxing in the soaking pool, it was time to enjoy the evening at the Cypress Room Bar. Rated as one of the best bars in its category, the Cypress Room is a rum bar. It has a Caribbean vibe with a great selection of rum and reggae music, making it the perfect place for a happy hour or that night cap, all of which offers a unique experience. However, if you prefer beer, housing a brewery onsite, the hotel has plenty of options to enjoy a good beer. My friend in Portland was right! Staying one extra night in town and experiencing a day back in school was a unique experience. It turned out that I never left the hotel from the moment I checked in. And, I didn’t have to; this historic elementary school transformed into a hotel has everything to keep you busy and entertained within its walls. Speaking of walls, they are covered with art work in the rooms and corridors depicting scenes and moments in the history of the old Kennedy Elementary School. 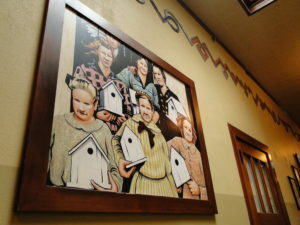 Even if you are not an overnight guest, grab a beer or a cocktail and walk around to check the art around you. I visited Portland multiple times in the past, but this was a delightful surprise. It was a memorable moment and a unique experience on my road trip. Just one of those surprises that came around and made me forget the last of days on the road and made me look forward to the days ahead in the Pacific Northwest and beyond. A Winter wonderland in Oregon! Officially it was Spring, but not at Crater Lake National Park. The park was still closed allowing access to the public only in limited areas. The temperature was only twenty-nine degrees with snow still falling. Periodically, the fast moving clouds would allow the blue skies to be seen through the clouds. It would in a matter of minutes give way to snow and gray skies. The dome in the middle of the crater looked majestic in its insular silent isolation. Aside from a few people here and there, the wind which blew in intermittent whistling gusts was the only sound that broke the silence. 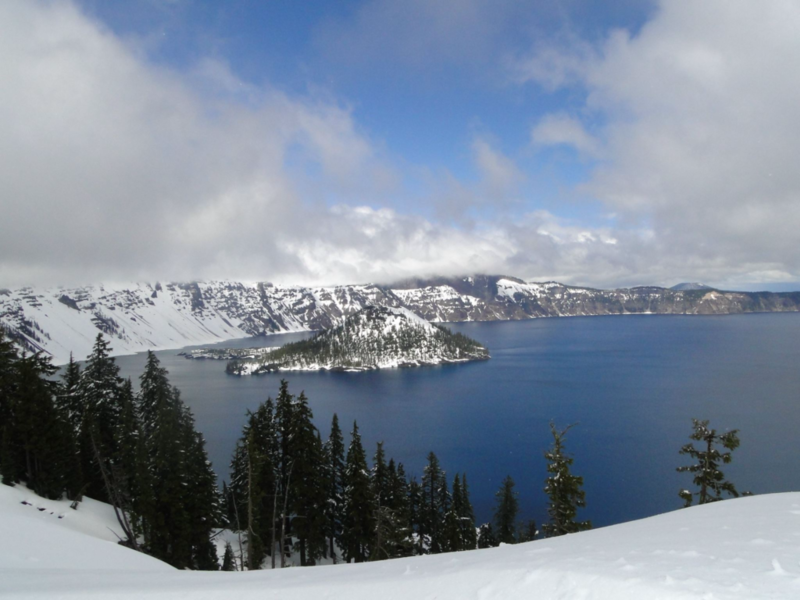 Located at the crest of the Cascade Mountain Range, Crater Lake National Park is, according to the park’s brochure, one of the snowiest inhabited places in America. Since the ranger’s service began tracking snow falls in the park in 1931, the 1930’s was the snowiest period receiving an average 614 inches of snow during that decade. Overall, the average annual snowfall at the park’s headquarters, by decade, has been on a downward trend. The lowest snowfall per decade was registered in the 2010’s which averaged on 377 inches: the decade of the 2000’s averaged 455 inches per year. The 2014-2015 Winter/Spring season registered the lowest ever snowfall, receiving only 43 feet of snow. 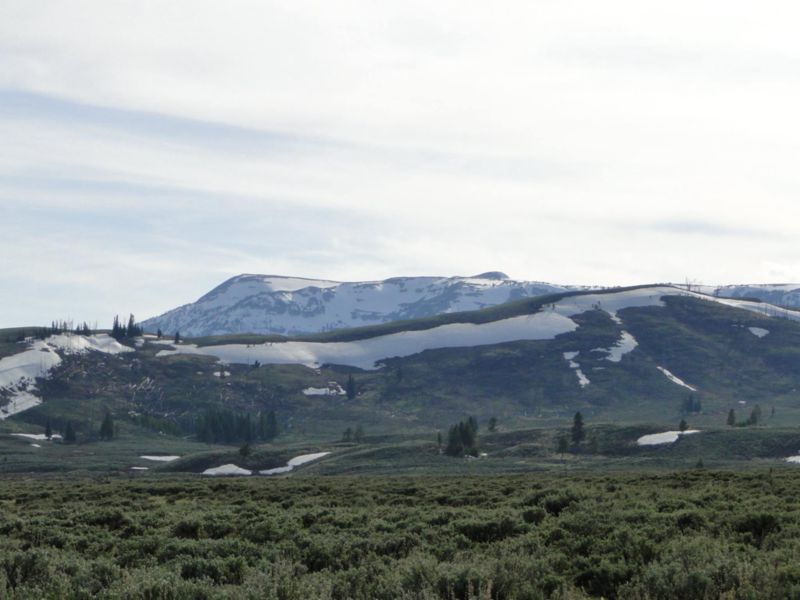 The consequences of declining snowfalls could be catastrophic to the ecosystem in the region. 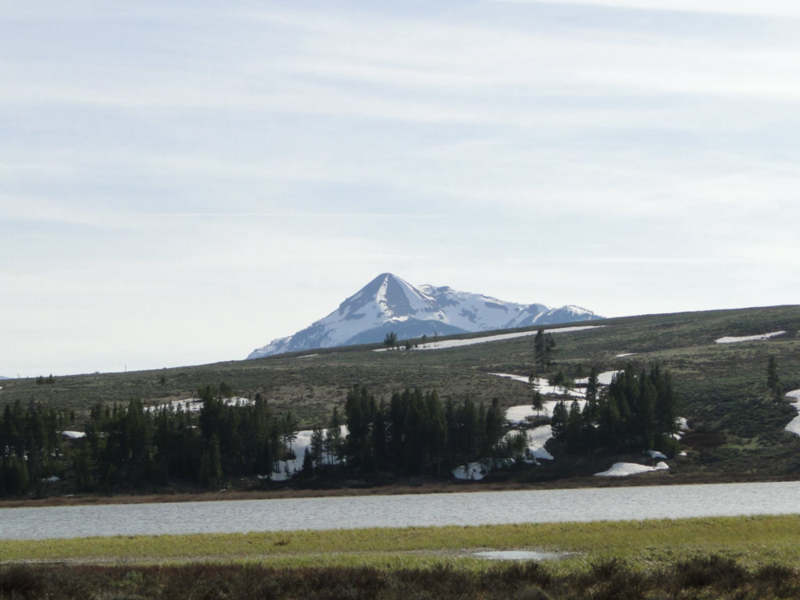 Besides feeding the Rogue, Umpqua, and Klamath Rivers, the very existence of the lake in the crater is dependent on water that comes from the sky. The lake in the crater does is not fed by rivers or streams and less snow and less rain could significantly change the landscape in the caldera at the mountain top. 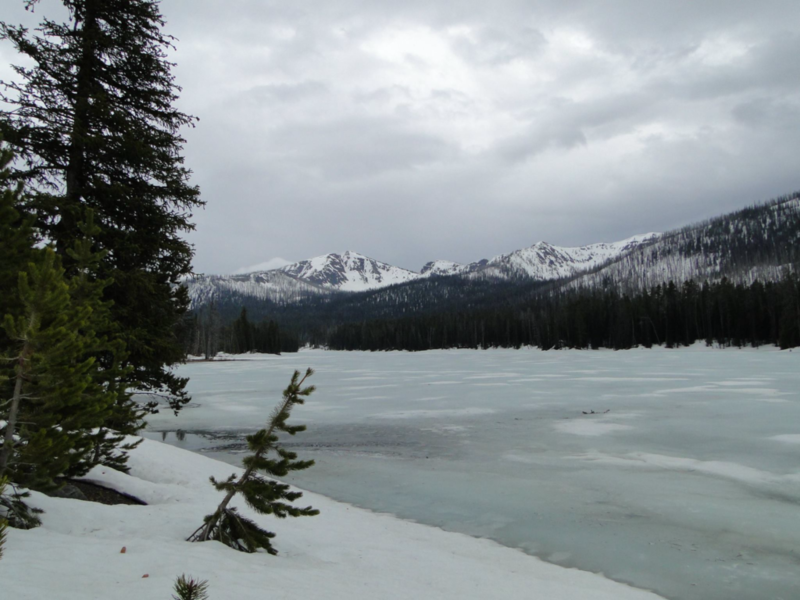 Hiking and snowshoeing were out of the question as the trail surrounding the lake was closed. On the other hand, it was encouraging to know that the snowfall level was higher than that of the prior year. And as all camping sites where I could camp were relatively too far from the lake, it was time to wrap up my short visit to the park. After taking some pictures around the lake and visiting the coffee shop and the restroom, which looked more like a military underground bunker, it was time to get on the road before it got late and dark to drive down from the mountain top. Spending the night in Klamath Falls before heading to the coast on my way to Portland, Oregon was the best plan for the night. Until now, this was the most complicated part of the road trip. I had reached a point of exhaustion and I was feeling a bit homesick. Perhaps the weather condition was making me feel a little anxious, because it was getting more and more difficult to find a national park that was open for camping and hiking. The distances to travel in a day to reach the next destination was getting longer and longer with nothing in between to make for a great stop. Undeniably, the landscape couldn’t be more appealing to the eye. However, with sorter Winter days, I could not afford to remain in one location for too long before getting dark. Even short distances became long because the driving conditions were not good.Traveling alone in Winter conditions requires a little more caution and coffee. The music and a cup of coffee were the only comfort to keep me company. It was getting dark when I left Crater Lake and as I came down the mountain, the snow had given way to freezing rain. With a hotel reserved in Klamath Falls, I knew that I had a bed and a much needed hot shower waiting for me. The rain had stopped when I arrived at the hotel, but it was windy and cold. After checking in, I headed out to try and have dinner. It was already past ten and the only place still serving some food in town was an Irish tavern. The food was not anything to brag about, but it was the first time I had a hot meal in five days. Besides, after hiking all that I hiked in the past few days, I could absorb some fatty food. The next morning I got up early and tried the breakfast that was included with my room. It was not a good breakfast! Everything seemed to be prepackaged food and even the coffee was not drinkable. Nonetheless, it was my chance to do laundry at the hotel that morning and reorganize the car. I knew that from that point on, I would need to make the winter clothes more accessible. A search about the destinations I had mind in the Pacific Northwest revealed that most of them were still closed. It crossed my mind to turn around and head south, but I was determined to make it to Seattle. I left Klamath Falls knowing that it was going to be a long drive to Portland, Oregon. Trying to avoid the snowy day in the mountains, I decided to take Route 38 heading west to US-101 northbound. Before getting to the coastline, I stopped in Elkton to have a real, old American style breakfast for lunch. After a quick stop to watch some of the local wildlife, I drove west toward the Pacific shores again. Still without a hotel reservation in Portland, I was open to the idea of finding a place to camp somewhere between Dunes City and Florence. Back home in New York, Eric was a little worried about this part of my road trip. We were constantly in contact with each other and discussing the weather conditions and the obstacles that I was starting to encounter. He continued to motivate me to push on and at the same time he wanted to make sure that I was safe, staying warm, and most importantly; having a good time. It turned out that Dunes City was just a drive through at that time of the year. Nothing was happening there. By the time I made it to Florence, I had called Eric and he made a reservation for me in Portland. Now I would have to make to Portland no matter how late I would arrive there. Trying to find a place to explore and enjoy had become a waste of time. 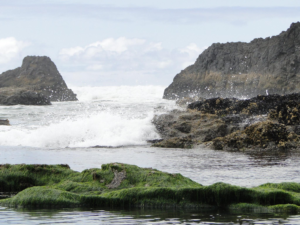 It was around mid afternoon that I found, almost by accident, the Sea Lion Caves on US-101, Florence, Oregon. 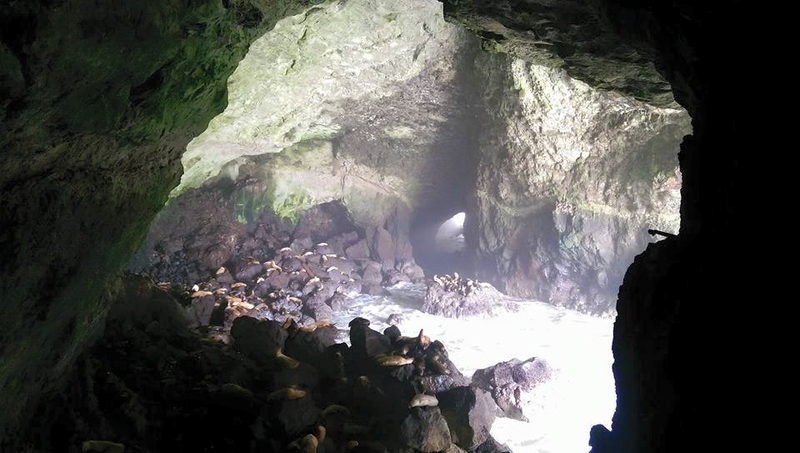 I had never heard about the Oregon’s Sea Lion Caves, which is one of the largest in the world. It turned out to be a great surprise on the road. It brought me back to a better mood and my visit to the caves made me forget the somewhat exhausting, worrisome last couple of days. Hundreds of sea lions were in the caves that day. Watching tens of them swimming the strong waves and trying to make to the caves or to climb on the rocks was a spectacular, rare event. Feeling somehow energized I got back on the road toward Portland. The plan was to stay in Portland for just one night as a stop over because my next destination where I planned to camp was Fort Stevens in the mouth of the Columbia River, before crossing into Washington. I arrived in Portland under heavy rain and checked into the hotel just before nine that evening. It felt good to be off the road! It was time order some take out food, download the pictures, and recharge batteries. Gay Travel: Why ‘Gay Travel’ and How Gays Travel? Why gay travel in the first place? Adam, from travelsofAdam.com, writing for a column published at Nomadic Matt How Gay Travel is Different (and Why it Matters), contended that “It’s about safety, it’s about comfort, it’s about politics. But it’s also about welcoming events, friendly accommodations, and having fun with similar travelers.” Adam summarized it succinctly and nailed it! Those of us who know the meaning of the ‘turn-off’ experience of getting the ‘funny look’, know that paying the same price as other travelers and getting second class treatment is painful. A fact that led to the coining of the expression ‘pink dollar’. Simply put: the LGBTQ community got tired of paying the same price to in return be discriminated by businesses that dispensed different service and treatment based on their customers’ sexual orientation. I recently wrote in my blog Tel Aviv: Middle East’s Most Gay Friendly City that it is not only the Tel Aviv’s Pride Festival that attracts travelers from most corners of the world. Tel Aviv has earned its place on the list of top LGBTQ travel destinations because it is truly welcoming and inclusive. It is not a reputation that a business garners just by placing a sticker on the window. Neither is won by countries or cities that run ads targeting the LGBTQ community. It is won through attitude toward visitors who genuinely feel that they are welcome. If there is one thing that I have learned about visiting places that are not gay friendly, is that uncomfortable feeling of relinquishing the freedom to be myself and going back into the closet. Even if it’s for just a few days, that is something that most of us are not going to do. Politics aside, economics matters! If I am going to drop some money into someone’s economy, I want to see a deeper commitment to equality and inclusiveness by governments. I also want to see that the local population is embracing those principles as well. And there is the issue of safety that is crucial to any traveler, but so much more relevant to LGBTQ travelers who can fall victims of violence just for being who they are. I travel solo! Hence, the name of my website! However, gays tend to travel in groups; either with a small or large group of friends, or join in large travel groups such as cruises. In the gay community, friends are family; and family travels together! That’s the simple truth! But there are other reasons which include ‘the more, the merrier’ element to have a great party. Safety justifies why traveling in group makes so much more sense because harassment can happen, as it has occurred even in gay friendly countries and cities. Nowhere is completely safe! Harassment and violence against an LGBTQ person can happen even in places known for their openness, such as San Diego, New York, Paris, or London. Remarkably, in a city that elected a gay mayor, Paris offers that sense of safety to its LGBTQ population and visitors alike. 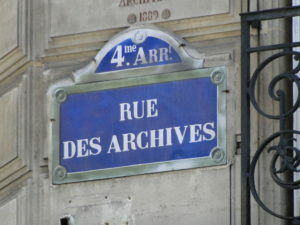 Just a few blocks from the City Hall, in the Le Marais which is also known as Paris gayborhood the relaxed atmosphere of countless cafes, restaurants, and clubs is just one example of gay friendly destination. 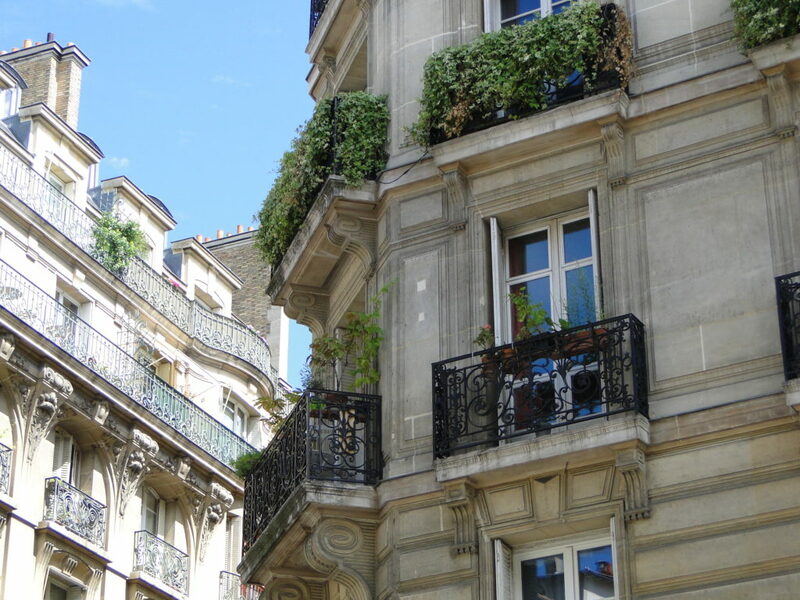 More importantly, the overwhelming attitude of Parisians is that of respect, friendliness, and welcoming. It’s a behavior and attitude that reflects its treatment to visitors as ‘people’, regardless of sexual orientation; as it should be anywhere else. However, that’s not the reality we live in. Therefore, we choose where to go and where not to go; making ‘gay travel’ relevant and necessary. Sadly, there are the countries like Russia, Egypt, India, and Turkey currently deemed too dangerous to visit as an LGBTQ person. Their laws criminalizing homosexuality is a violation of human rights and a warning to gay travelers to stay away. However, they are not the only ones to be avoided because there are over 70 countries where homosexuality is still illegal and considered a crime. Besides the fact that traveling as part of a group adds a sense of being ‘safer’, it can also reduce costs from car rental to sharing accommodations, renting a beach house, or sharing an apartment. Nonetheless, there is a sizeable number of gay travelers who travel solo, which can be a bit more challenging than traveling with friends. 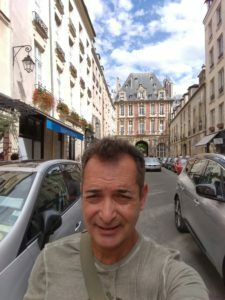 Gay solo travel means you are on your own! However, it does not mean that you are alone. It means you will experience the local culture a bit more in depth. Forcibly, you will connect with other travelers and interact with more locals than just your waiter at a café or the cab driver. I admit that when traveling solo, the comfort zone that most of us enjoy staying in so much, is the first thing to go off the window. Although our comfort zone is not the first thing that we are willing to surrender, it can be rewarding for those who are daring travelers and seek to really get out there. In such case, it becomes more important to stick to your own kind. That’s when ‘gaycation’ becomes a real thing. It means visiting gay friendly destinations, gay events, and supporting those economies and neighborhoods that support and welcome you for who you are. Many of the activities I like doing and hobbies I have are not gay per se. Places and landmarks I visit are not exclusively for gays, and some events that I attend have no label. Nonetheless, as a traveler I am who I am and I must consider if I can fully enjoy what I choose to do; or if I will have to watch my back. Being in backcountry solo hiking for long periods of time, I am just a hiker who happens to be gay. My sexuality should not matter a bit. Still, I know that depending on where I am, carrying a rainbow flag or wearing a T-shirt with a slogan calling for marriage equality is not a smart thing to do. Encountering a militia man, who made it a point to show me that he was armed, during a solo backpacking hike in a remote area in Utah reminded me of the risks any of us may face: gay or straight. 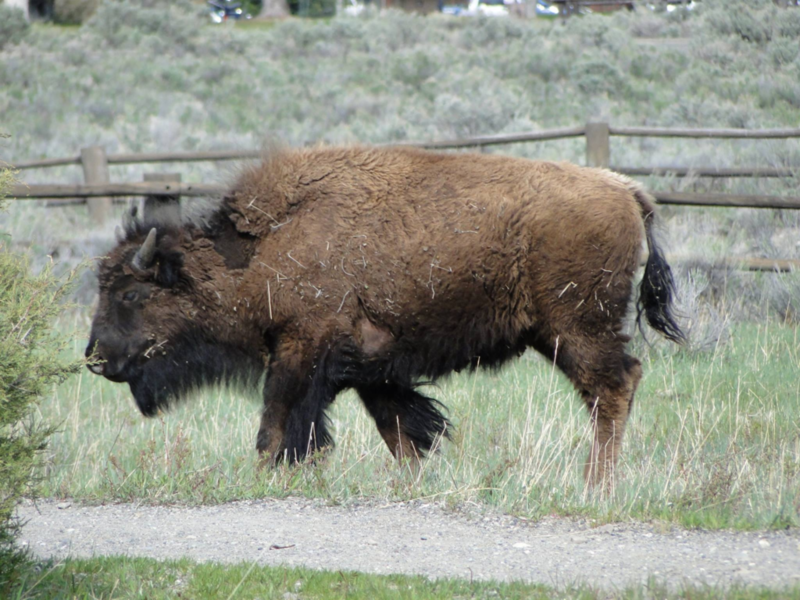 Wyoming: Buffalo Bill, Cowboys, and Whiskey - Travelling With Me on Yellowstone National Park: How to Plan a Visit?